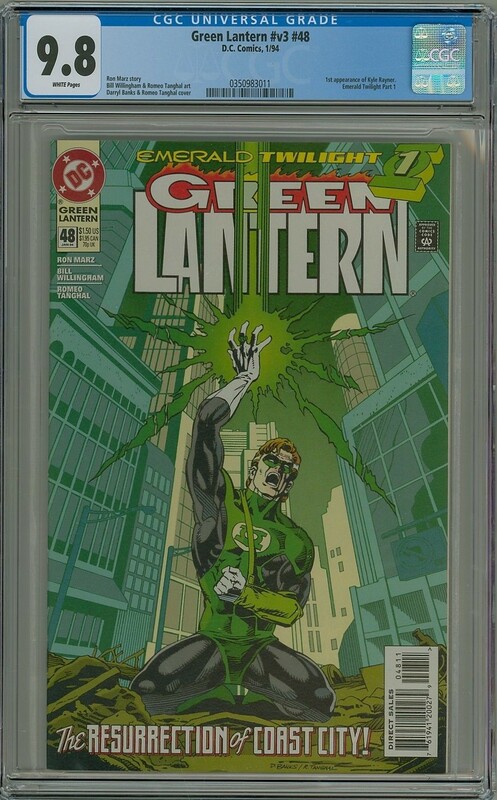 to guess and discuss the final sales price of CGC auctions about to close! 1st Appearance of Kyle Raynor. 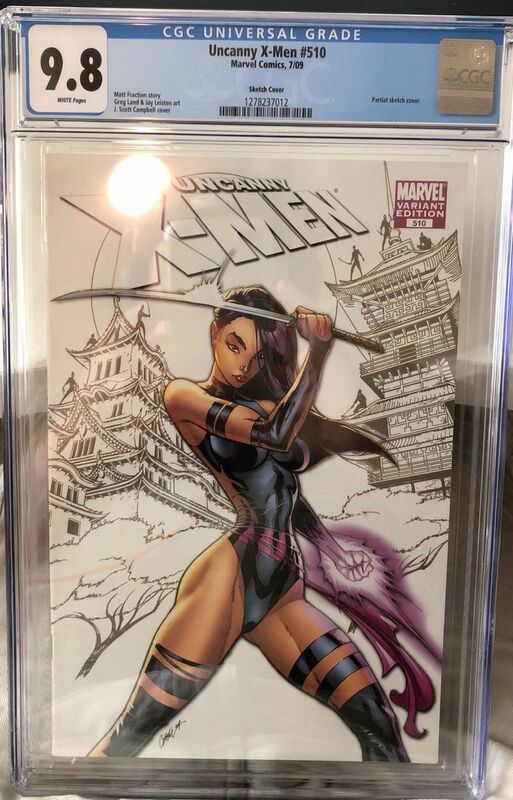 Sold on Sunday, December 16, 2018 via eBay Auction for $600 after 28 bids. 1st Full Appearance of Bloodshot. 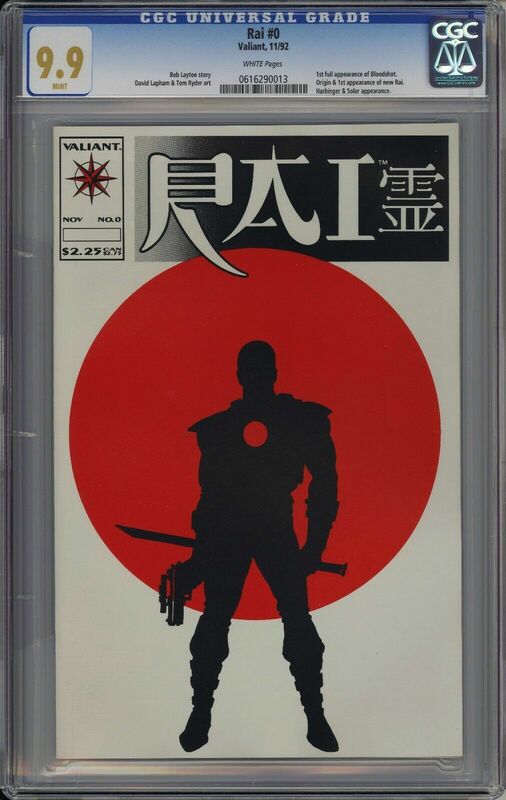 1st Appearance of the new Rai. 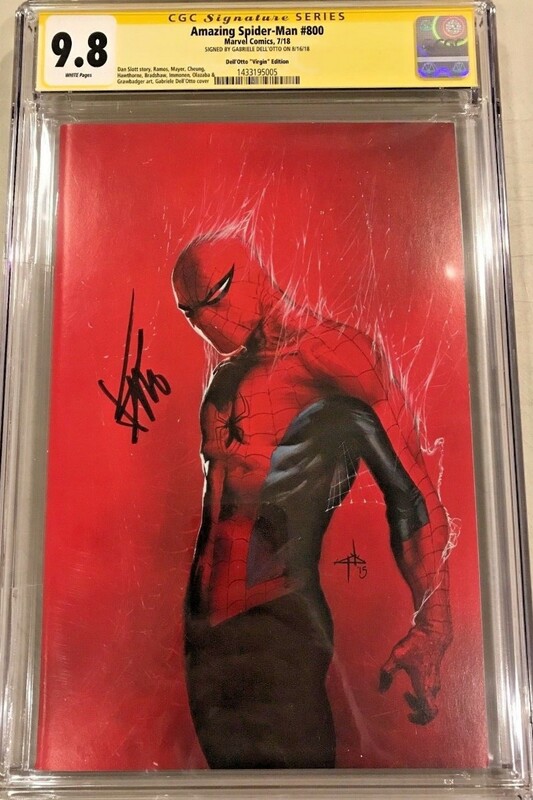 Sold on Monday, February 18, 2019 via eBay Buy It Now for $2,649.99. 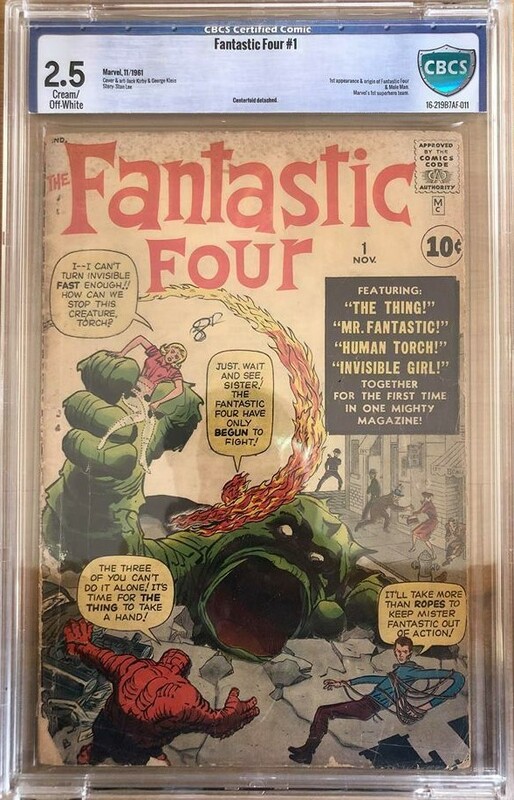 First appearance of the Fantastic Four. 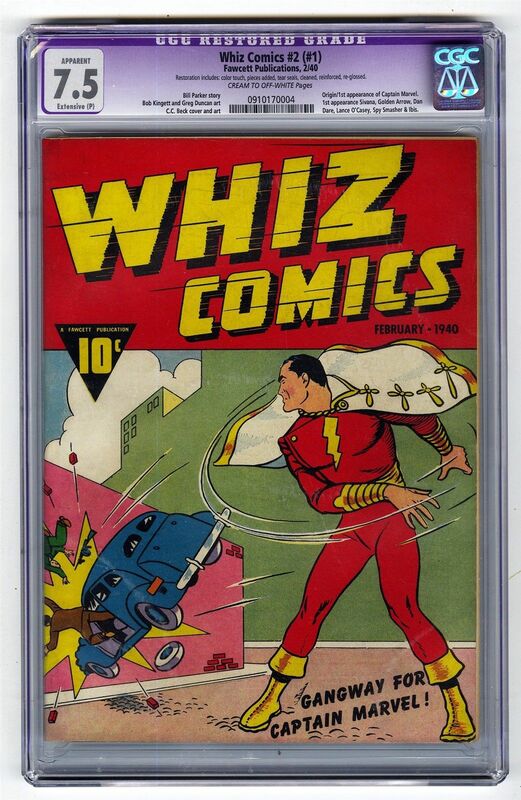 Sold on Tuesday, February 5, 2019 via eBay Auction for $4,702 after 45 bids. Chromium wraparound cover. Conclusion to "Age of Apocalypse" story. Sold on Tuesday, February 12, 2019 via eBay Buy It Now for $999.99. Restoration includes: pieces replaced, color touch, tear seals, cleaned. First Appearance of Spider-Man. 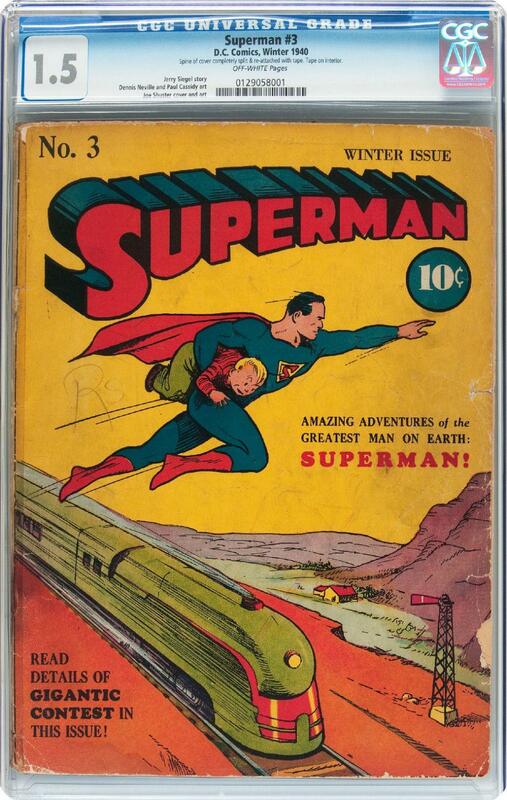 Sold on Tuesday, December 27 via eBay Auction for $27,124.99 after 39 bids. 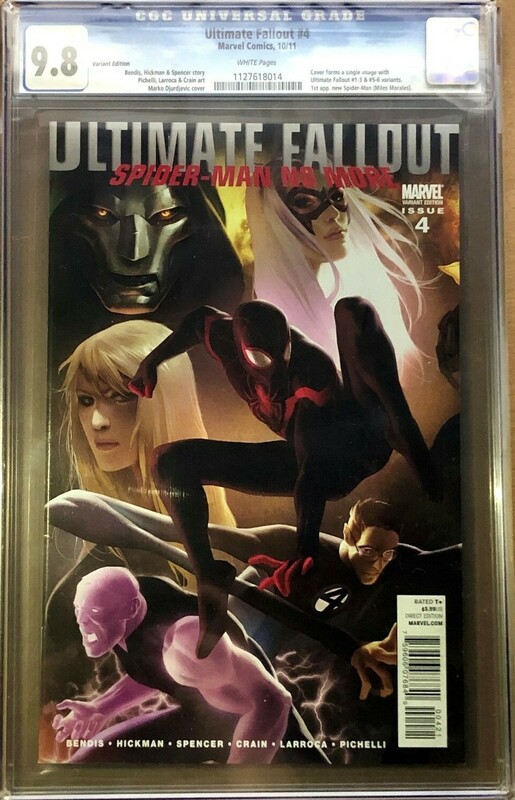 First Appearance of Miles Morales. Sold on Friday, January 11, 2019 via eBay Best Offer for $2,000. Back cover missing, does not affect story. Front cover detached. Tape on cover & interior. INCOMPLETE. 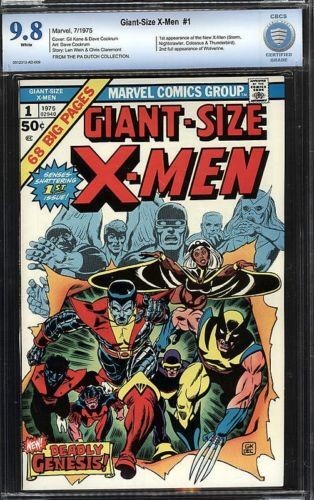 Sold on Sunday, January 27, 2019 via eBay Auction for $4,551 after 61 bids. 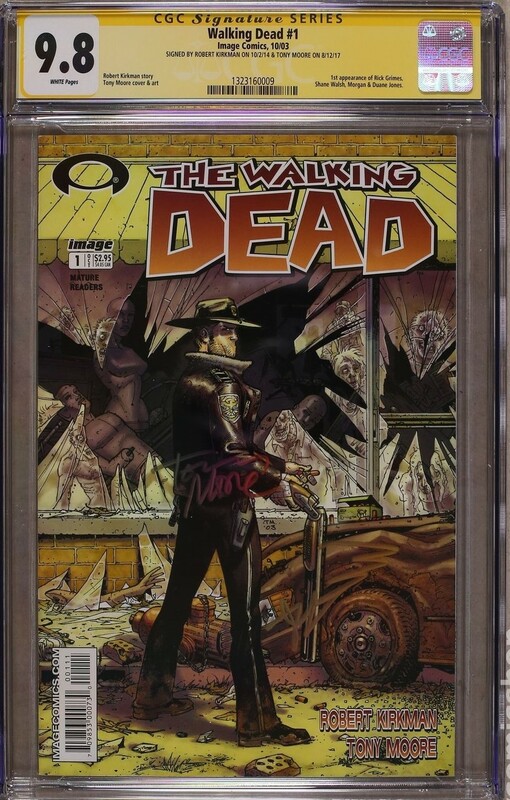 Signed by Robert Kirkman on October 17, 2018. 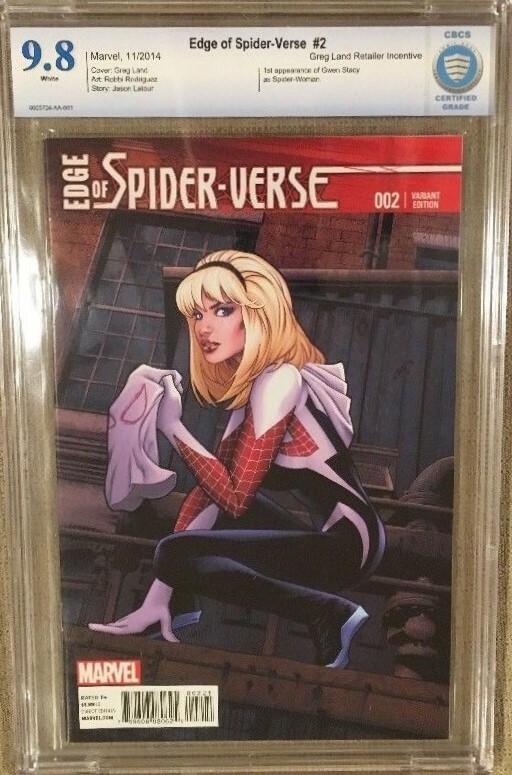 Sold on Thursday, January 31, 2019 via eBay Buy It Now for $2,999.99. 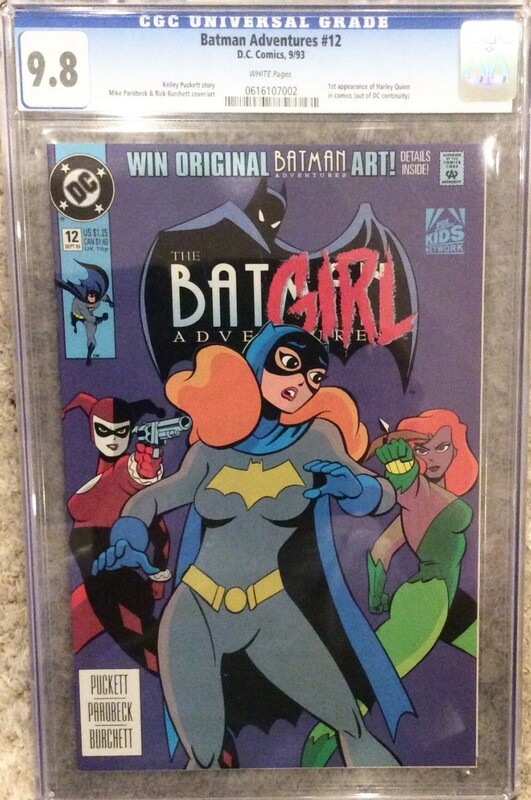 First Appearance of Harley Quinn. 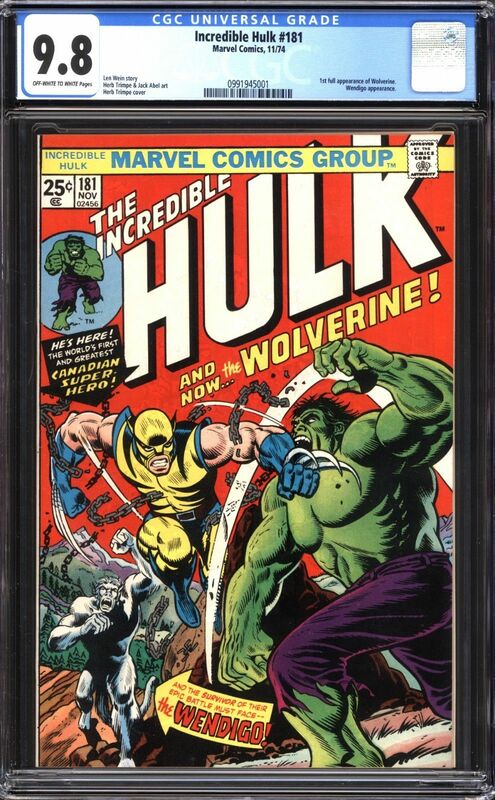 Sold on Friday, January 22 via eBay Auction for $1,775 after 32 bids. Coverless (Cover, 4th Wrap, Page 27, and 3 Center Wraps are color copies), Incomplete. 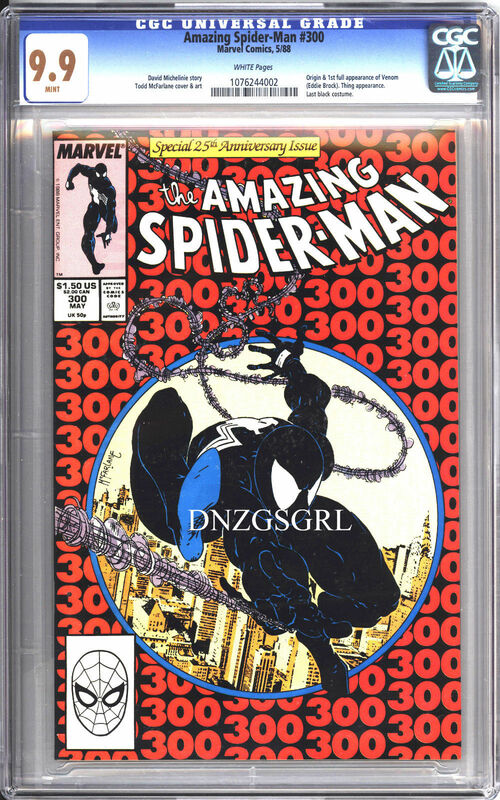 Sold on Tuesday, December 18, 2018 via eBay Auction for $35,100 after 92 bids. 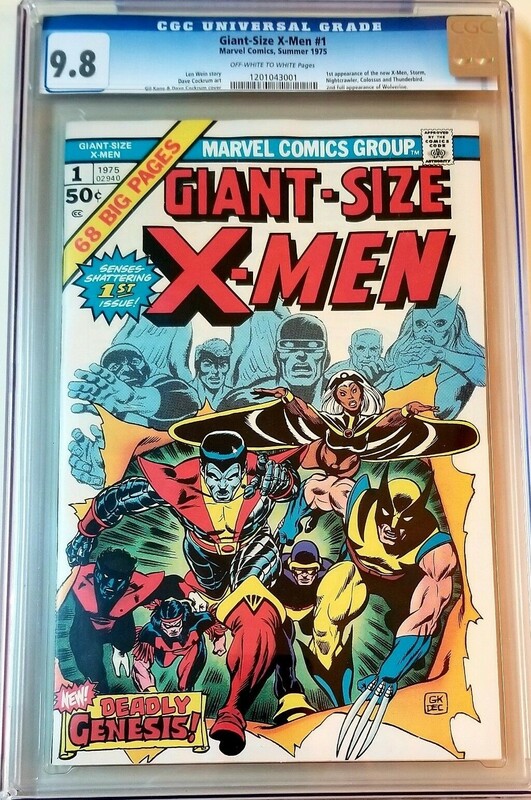 First Appearance of the New X-Men (Colossus, Nightcrawler, Storm, Thunderbird). 2nd Full Appearance of Wolverine. 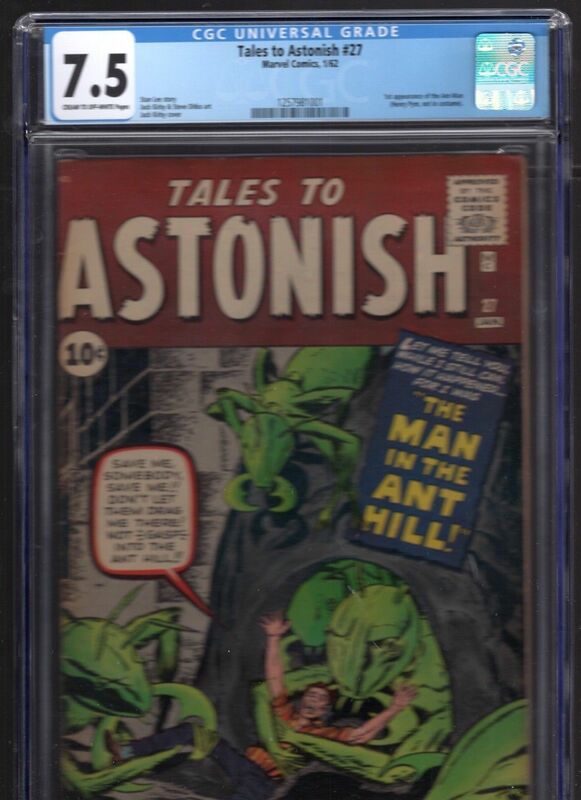 Sold on Sunday, December 2, 2018 via eBay Auction for $11,141.75 after 44 bids. 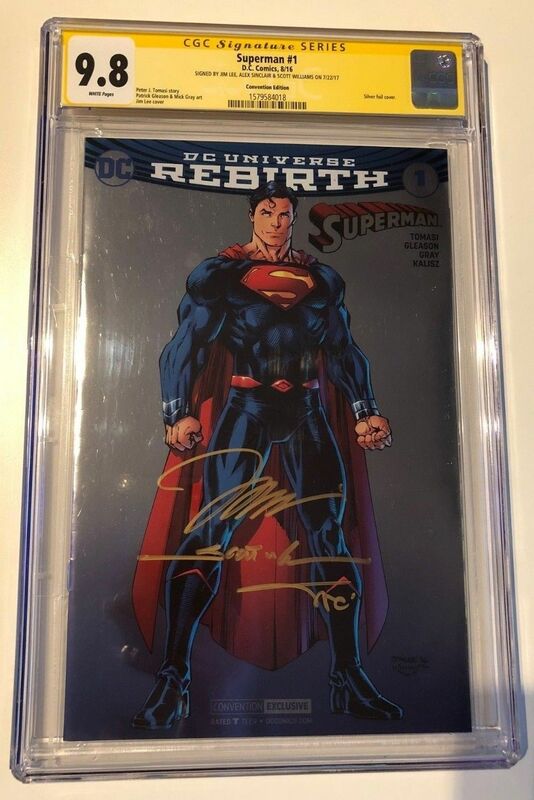 Sold on Saturday, December 22, 2018 via eBay Auction for $29,100 after 2 bids. 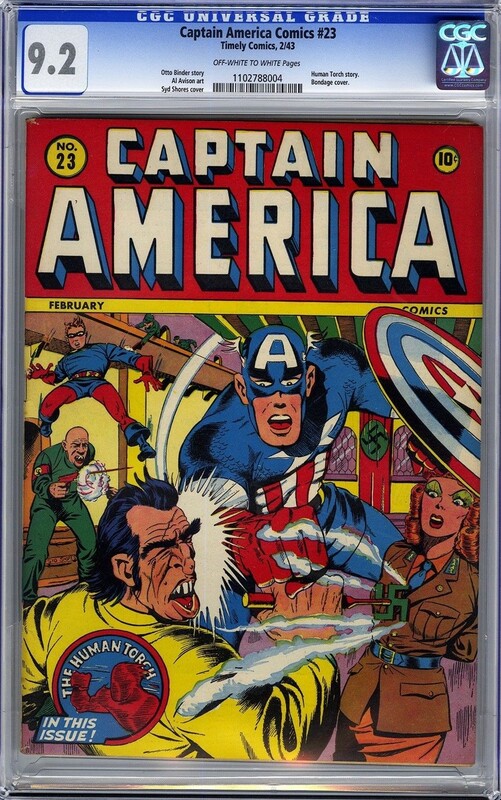 First Silver Age Appearance of Captain America. Sold on Monday, December 3, 2018 via eBay Best Offer for $12,500. 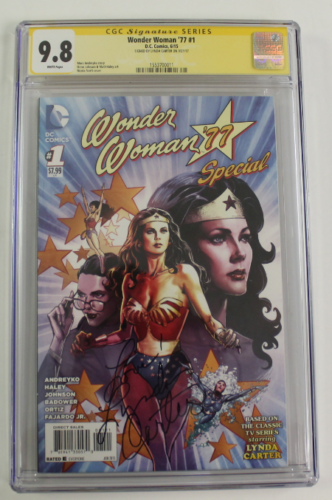 Signed by Lynda Carter on September 21, 2017. Sold on Tuesday, November 20, 2018 via eBay Buy It Now for $835.99. 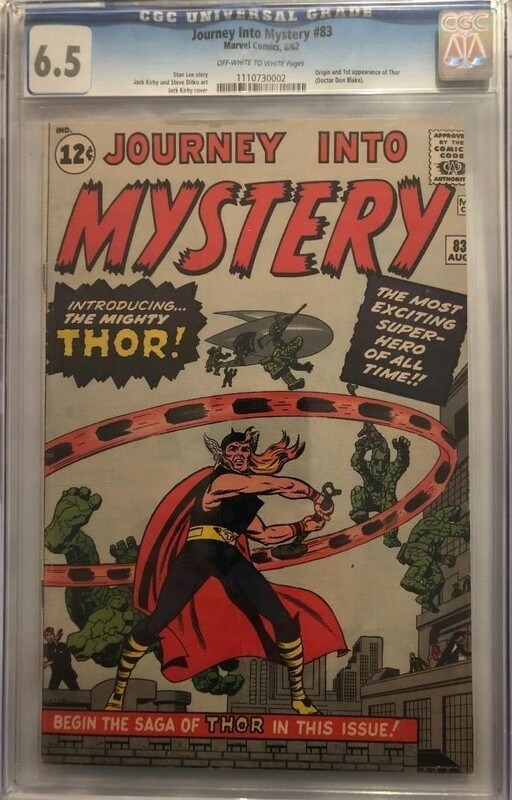 Sold on Sunday, December 2, 2018 via eBay Auction for $27,201 after 67 bids. Sold on Tuesday, November 20, 2018 via eBay Best Offer for $13,300. Sold on Tuesday, October 16, 2018 via eBay Best Offer for $13,300. 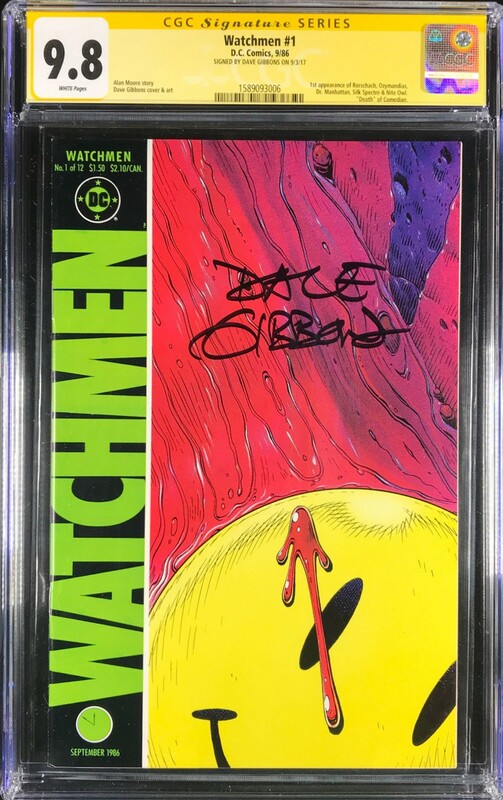 Sold on Sunday, October 21, 2018 for $2,250 after 41 bids. First Appearance of Storm Shadow. Silent Issue. 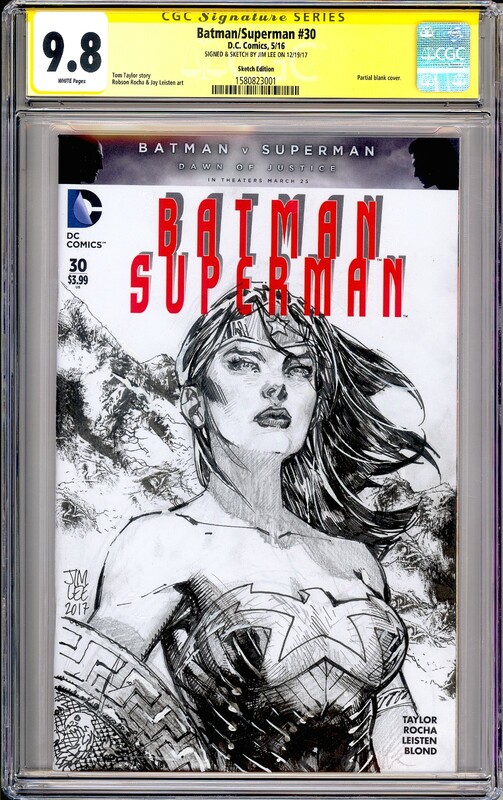 Sold on Tuesday, October 16, 2018 via eBay Buy It Now for $1,150. 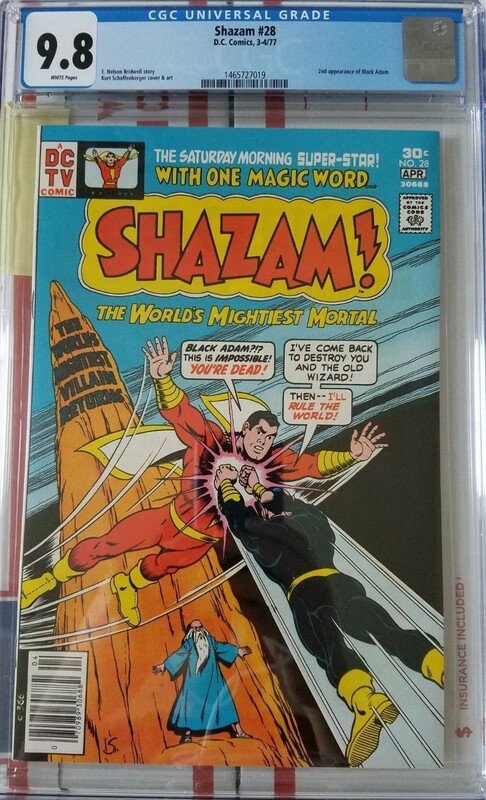 Sold on Monday, October 15, 2018 via eBay Auction for $1,650 after 47 bids. 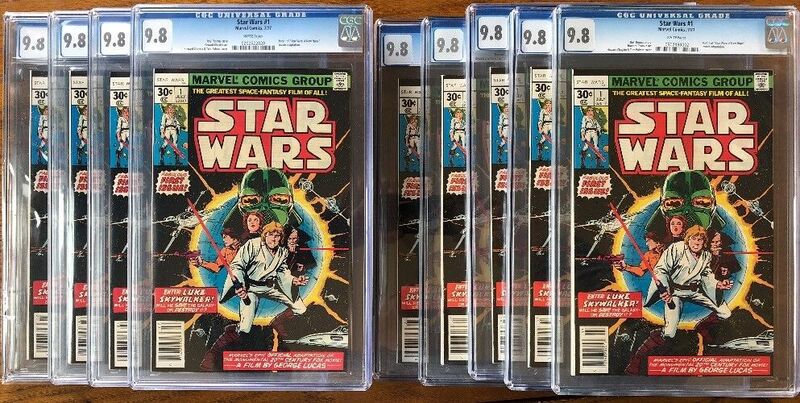 Sold on Sunday, September 30, 2018 via eBay Auction for $9,051 after 72 bids. 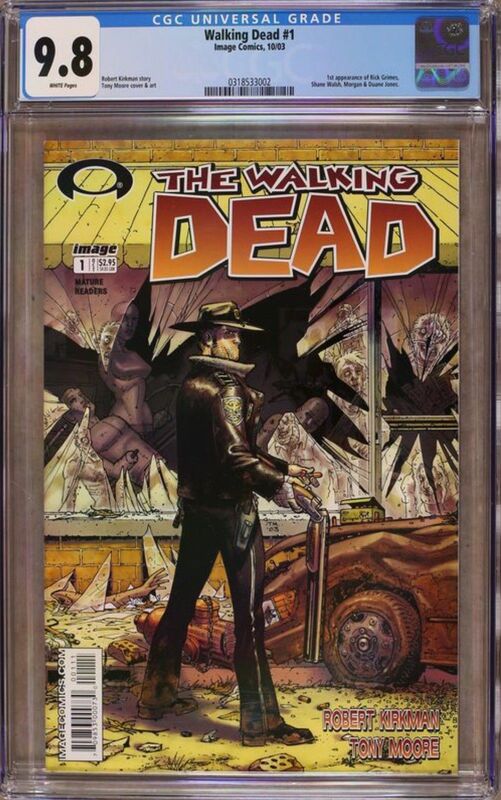 Sold on Thursday, September 27 for $850 via eBay Buy It Now. 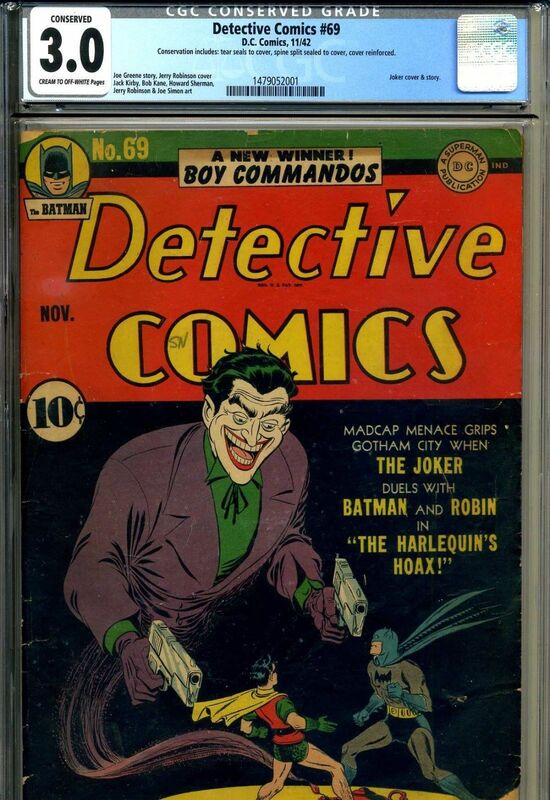 Sold on Thursday, October 11 for $1,574 via eBay auction after 36 bids. Sold on Monday, October 8, 2018 via eBay Best Offer for $20,000. 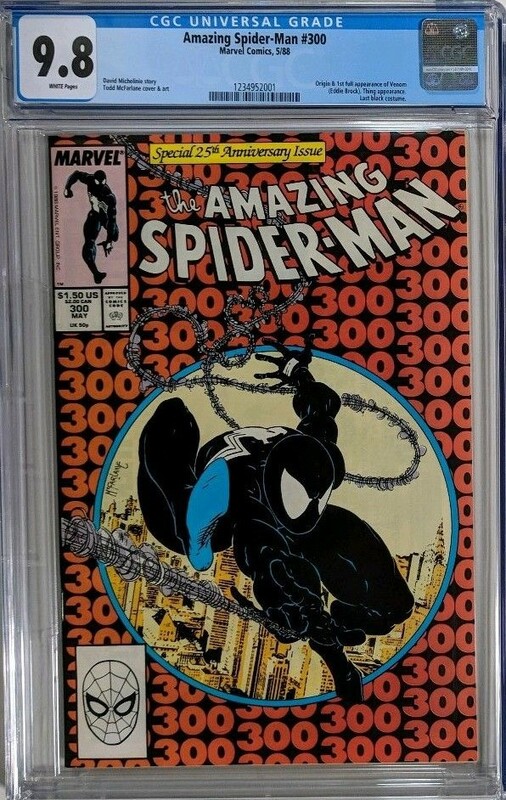 Sold on Sunday, September 30, 2018 via eBay Auction for $2,601 after 15 bids. 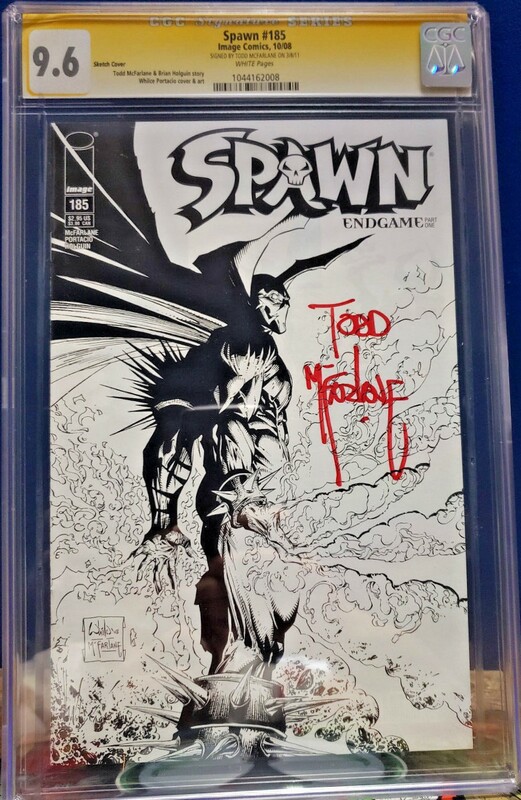 Signed by Todd McFarlane on 06/12/2018. 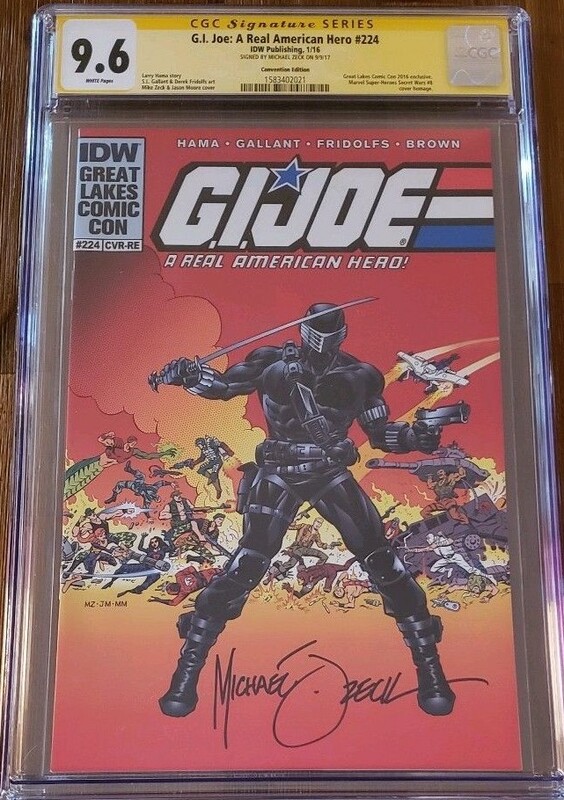 Sold on Sunday, September 16, 2018 via eBay Auction for $380 after 17 bids. 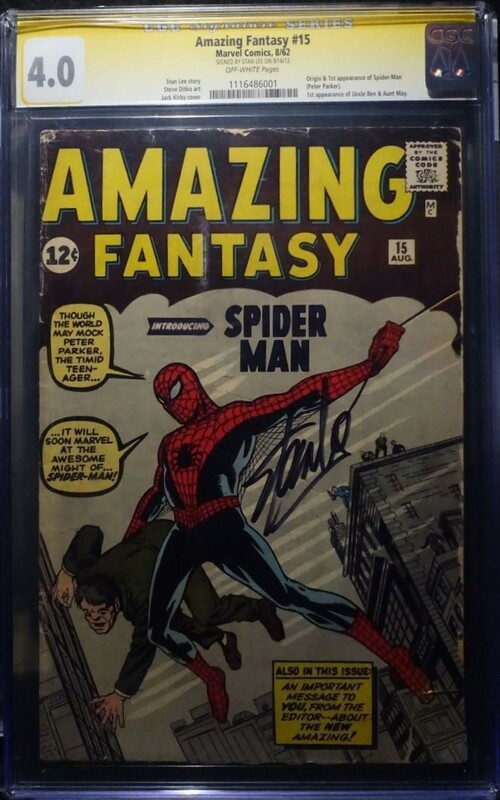 Signed by Stan Lee on 06/08/2014. 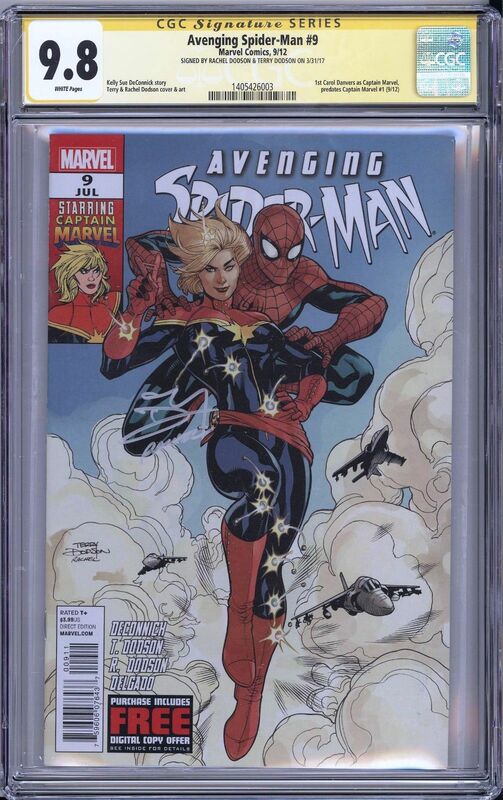 Sold on Tuesday, September 18, 2018 via eBay Auction for $4,458 with 1 bid. Sold on Thursday, August 23, 2018 via eBay Best Offer for $125,000. 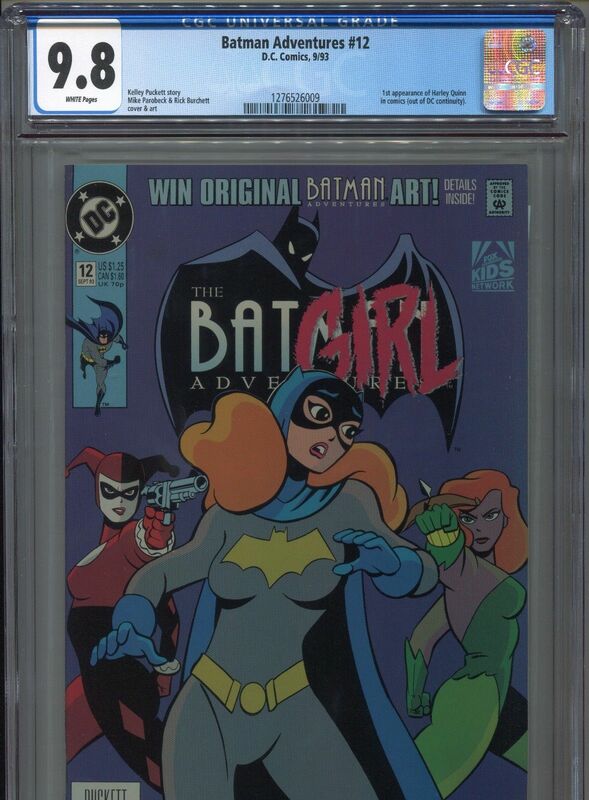 Sold on Sunday, August 26 via eBay Auction for $621 after 28 bids. Sold on Saturday, July 28 via eBay Buy It Now for $5,500. 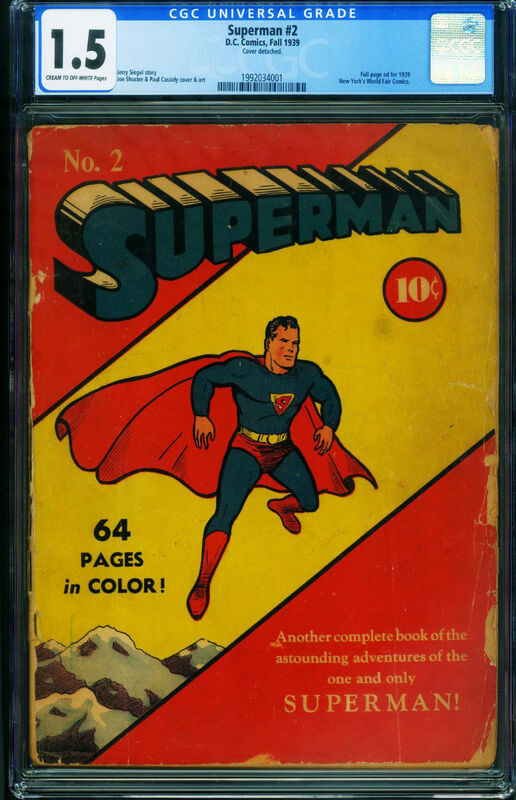 Sold on Sunday, August 19 via eBay Auction for $1,525 after 38 bids. Sold on Sunday, August 19 via eBay Buy It Now for $2,499.99. 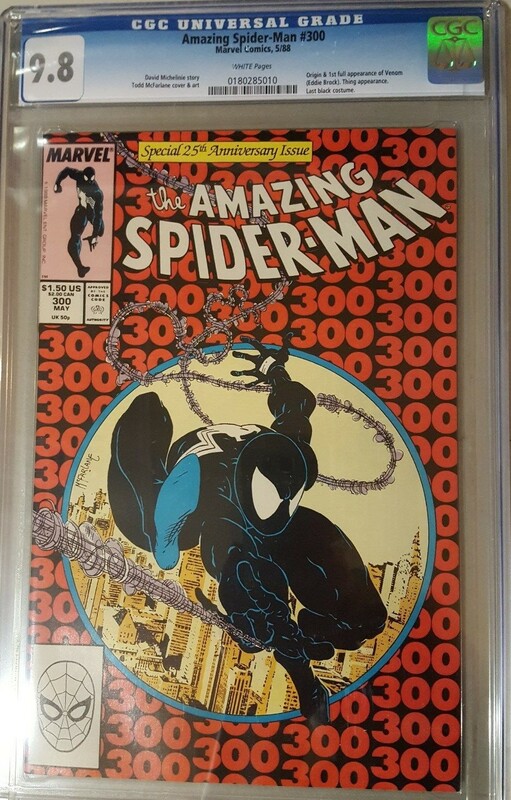 Sold on Thursday, August 16 via eBay Auction for $305.19 after 12 bids. 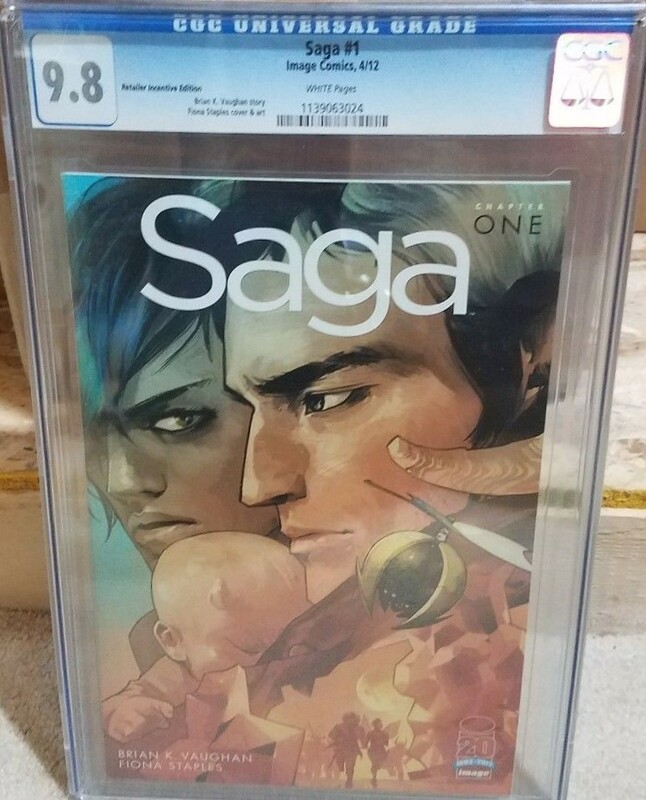 Sold on Thursday, August 16, 2018 via eBay Auction for $1,111.11 after 2 bids. 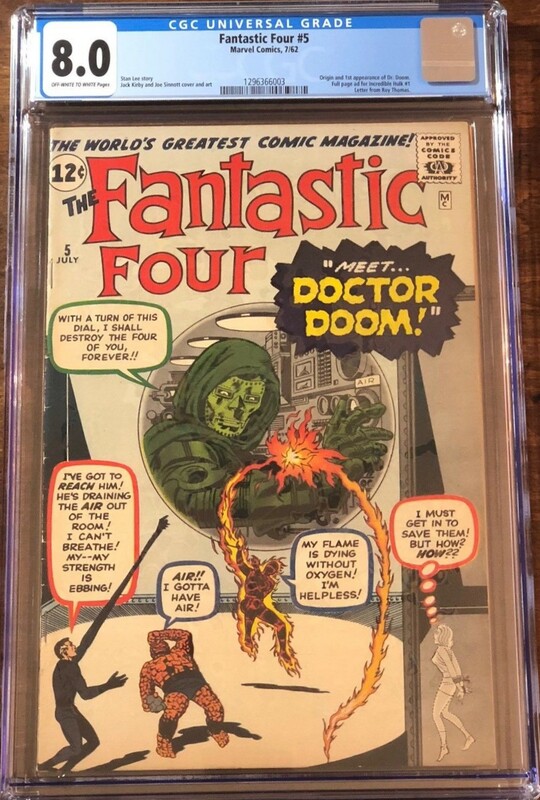 First Appearance of Dr. Doom. Sold on Thursday, August 16, 2018 via eBay Buy It Now for $18,995. 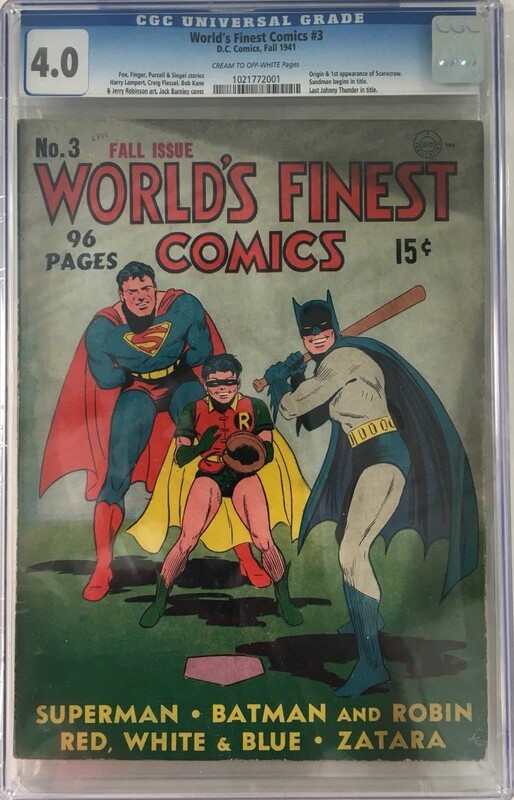 Sold on Sunday, August 12 via eBay Best Offer for $1,000. 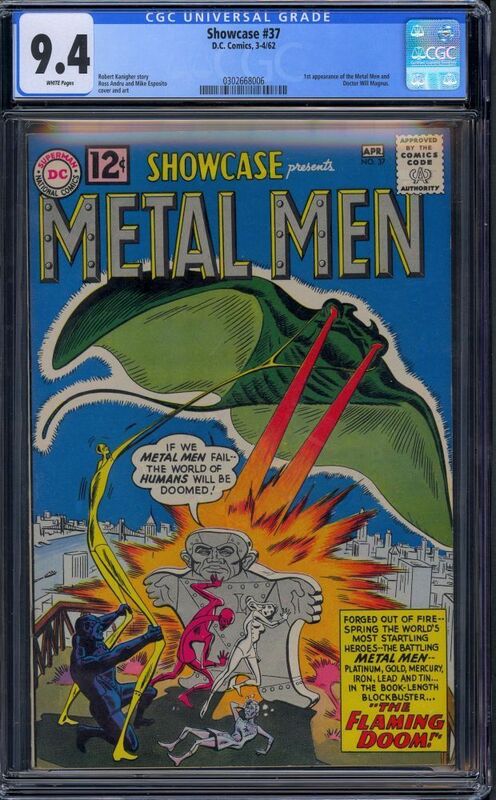 First Appearance of the Metal Men and Dr. Magnus. Sold on Thursday, July 12, 2018 via eBay Best Offer for $22,500. 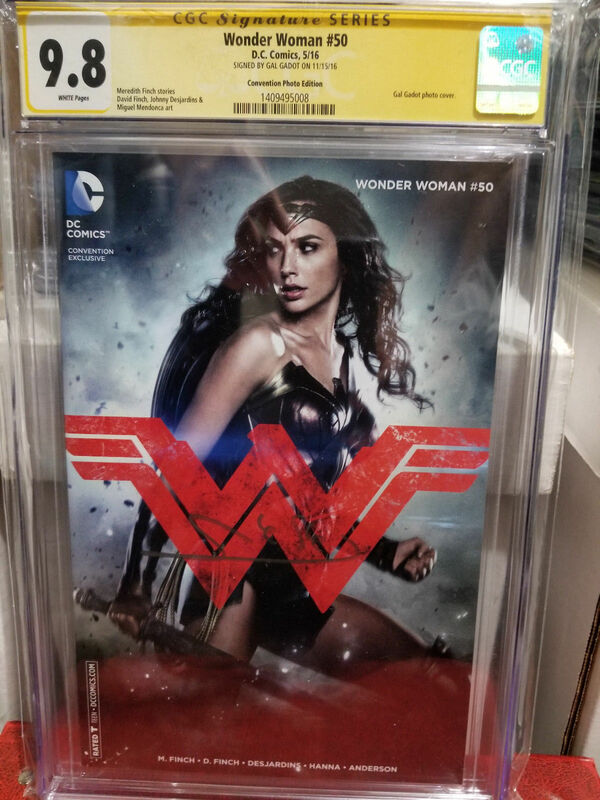 Sold on Friday, July 20, 2018 via eBay Auction for $10,100 after 19 bids. 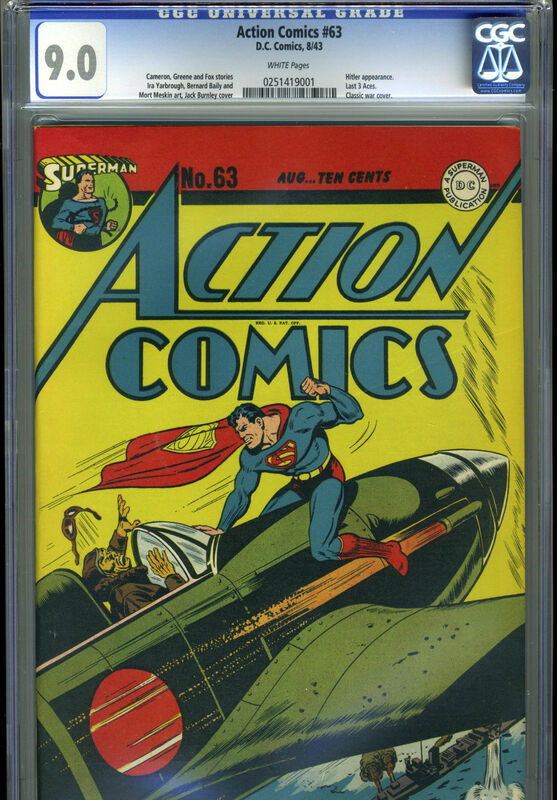 Sold on Saturday, April 28, 2018 via eBay Auction for $1,913 after 11 bids. 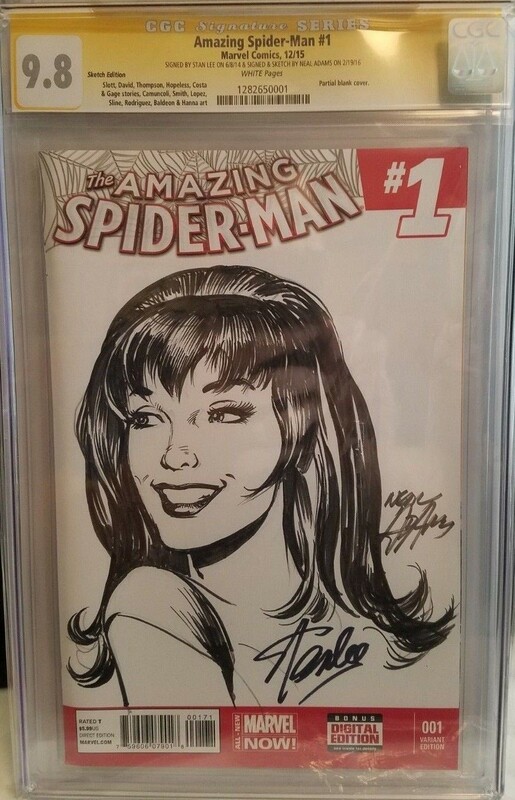 Sold on Monday, June 4, 2018 via eBay Auction for $4,000 after 41 bids. Sold on Wednesday, July 17, 2018 for $12,500 via eBay Buy It Now. 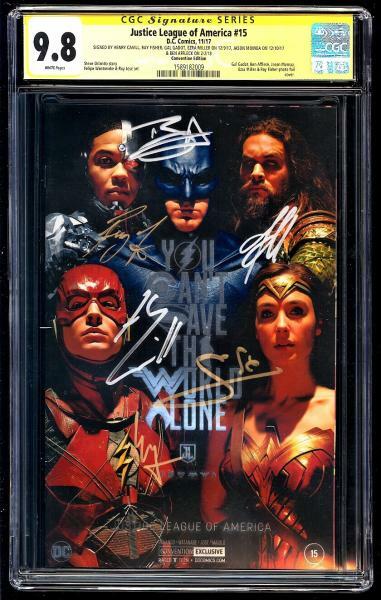 Sold on Wednesday, July 17, 2018 for $1,299.99 via eBay Buy It Now. 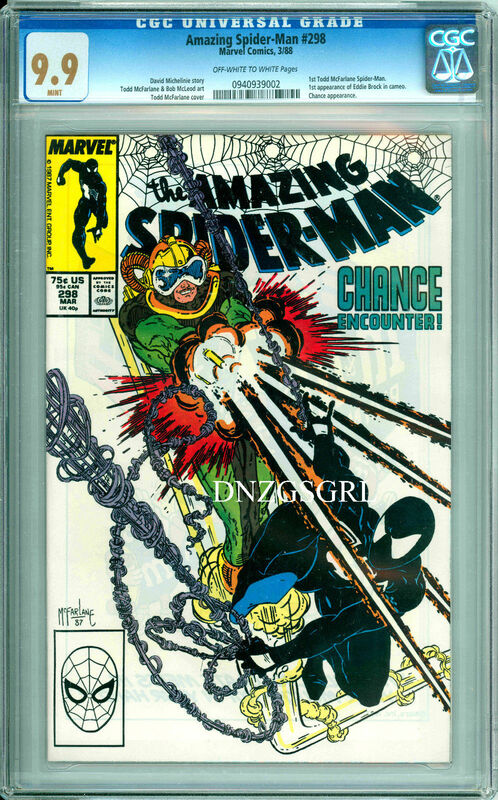 Note: Seller indicated that the case is cracked, but does not impact condition of comic book inside. 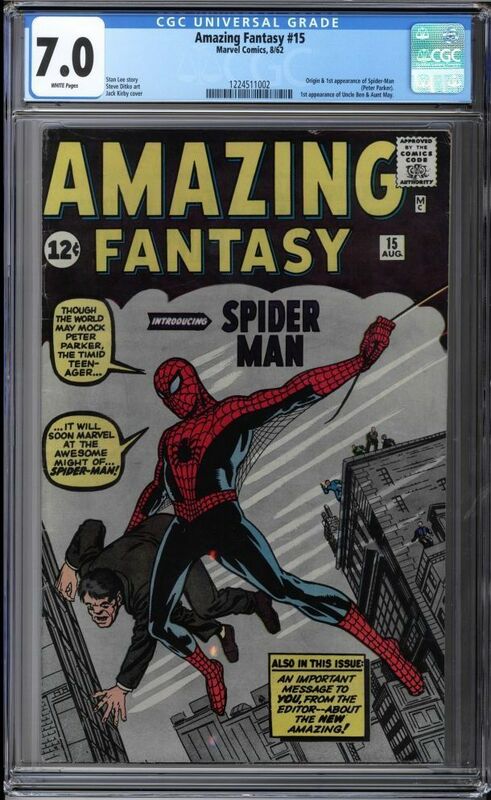 Sold on Wednesday, July 18, 2018 via eBay Auction for $1,075 after 14 bids. Restoration is Extensive Proffesional and includes color touch, pieces added, tear seals, cleaned, reinforced and has been reglossed. 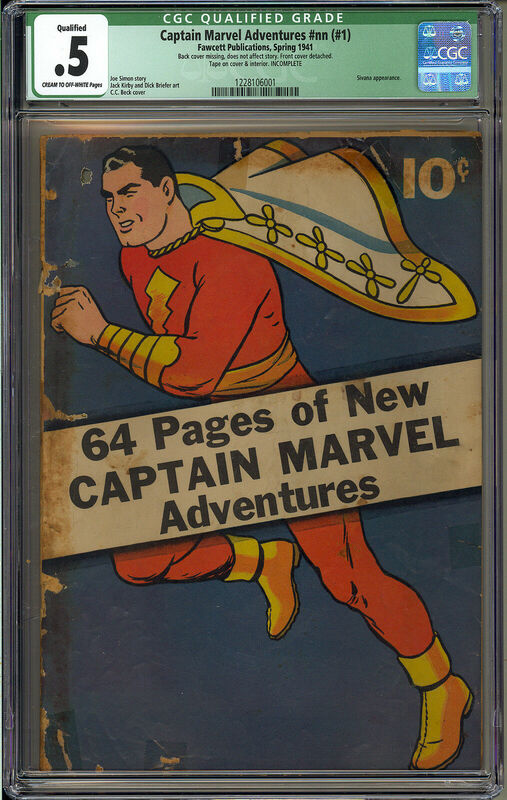 First Appearance and Origin of Captain Marvel (Shazam). 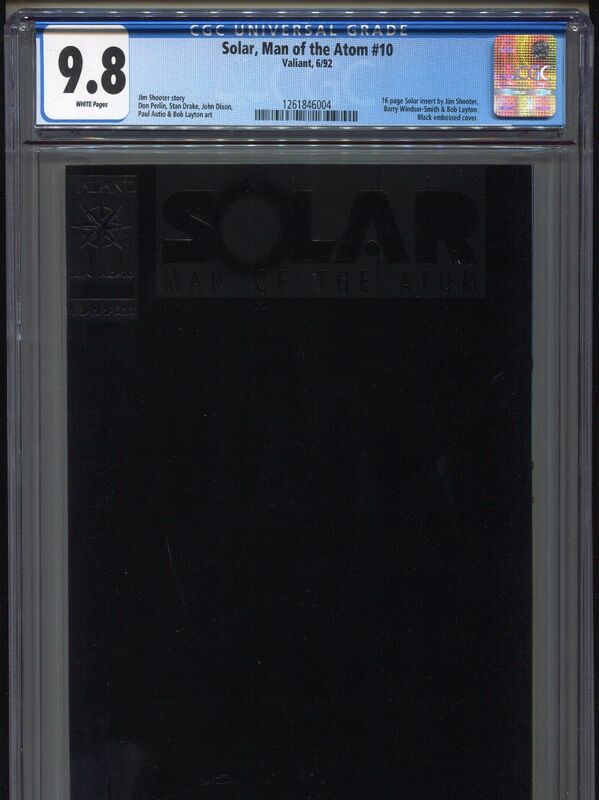 Sold on Sunday, July 15, 2018 via eBay Auction for $21,100 after 81 bids. 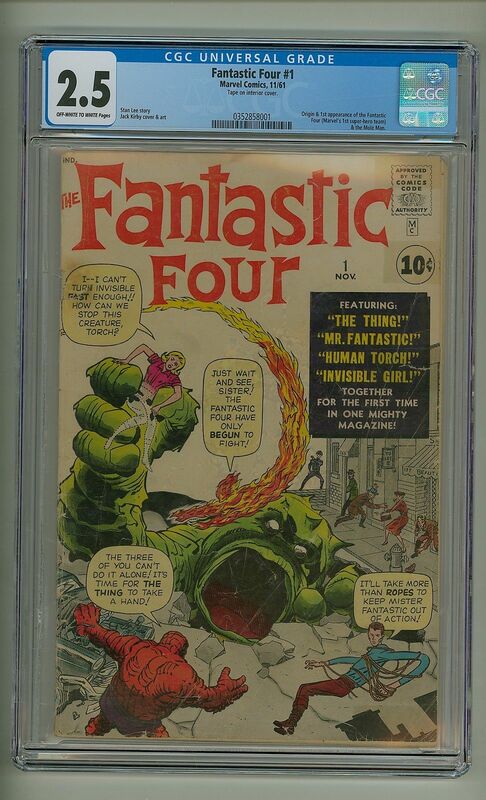 First Appearance and Origin of the Fantastic Four. 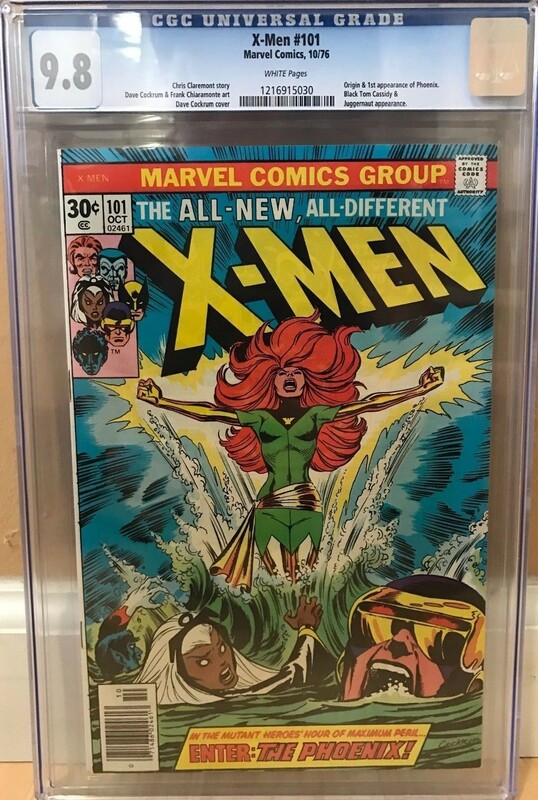 Sold on Thursday, July 12, 2018 via eBay Auction for $8,900 after 9 bids. 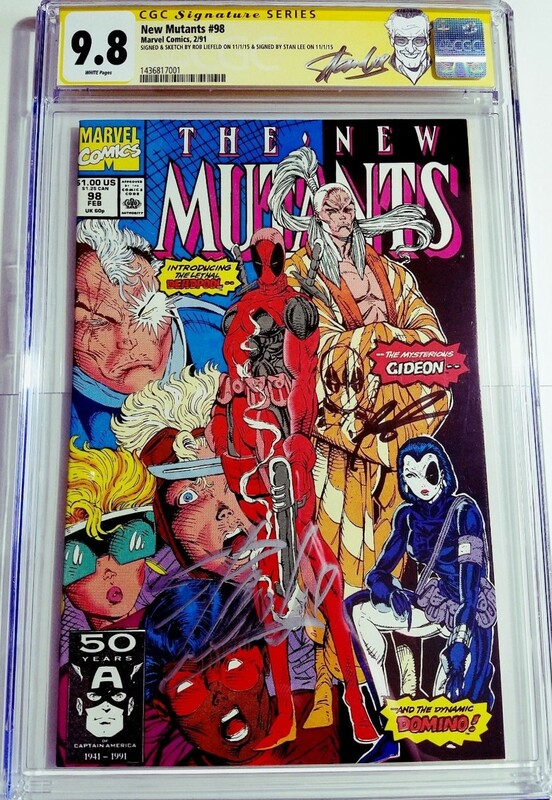 Sold on Monday, July 9, 2018 via eBay Auction for $5,5499.99 after 79 bids. 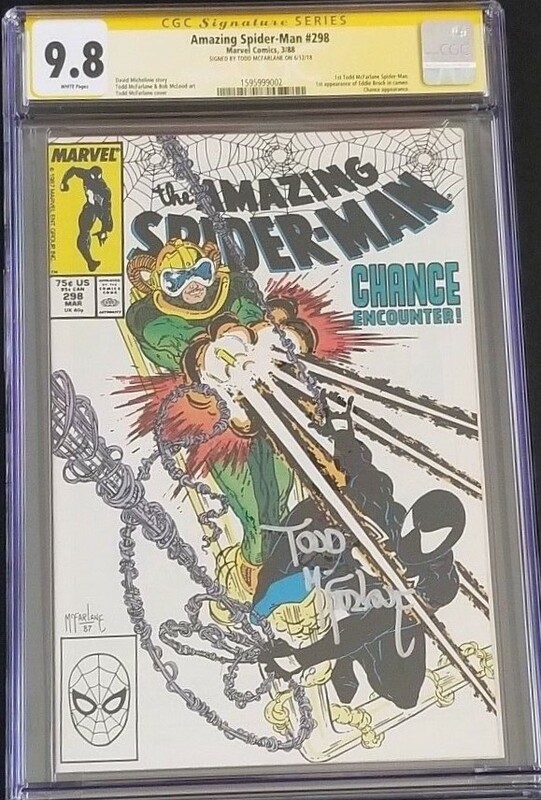 Sold on Monday, July 2, 2018 via eBay Auction for $1,792.87 after 28 bids. Sold on Friday, July 6, 2018 via eBay Buy It Now for $125,000. 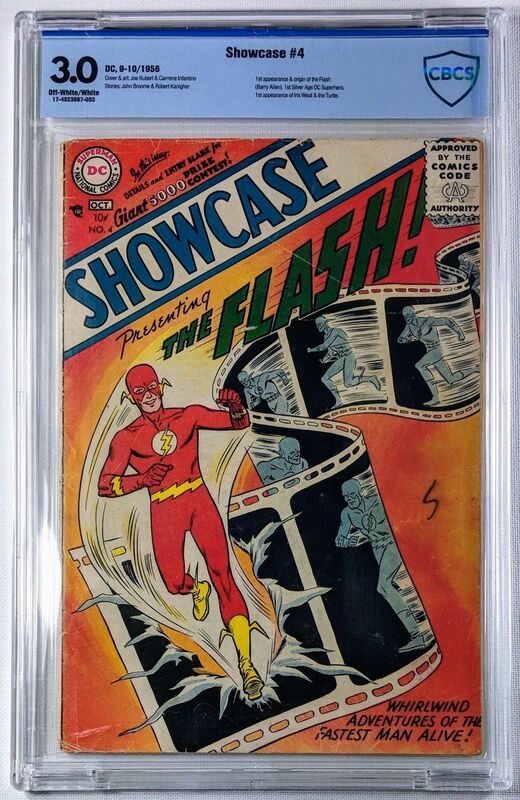 First appearance of the Silver Age Flash. Sold on Wednesday, June 27, 2018 via eBay Best Offer for $8,555. First Appearance and Origin of Dr. Strange. 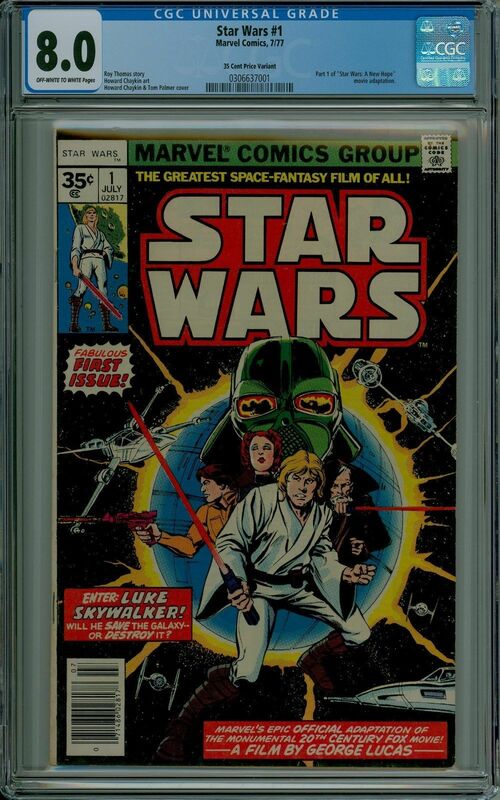 Sold on Monday, June 4, 2018 via eBay Auction for $4,006 after 43 bids. 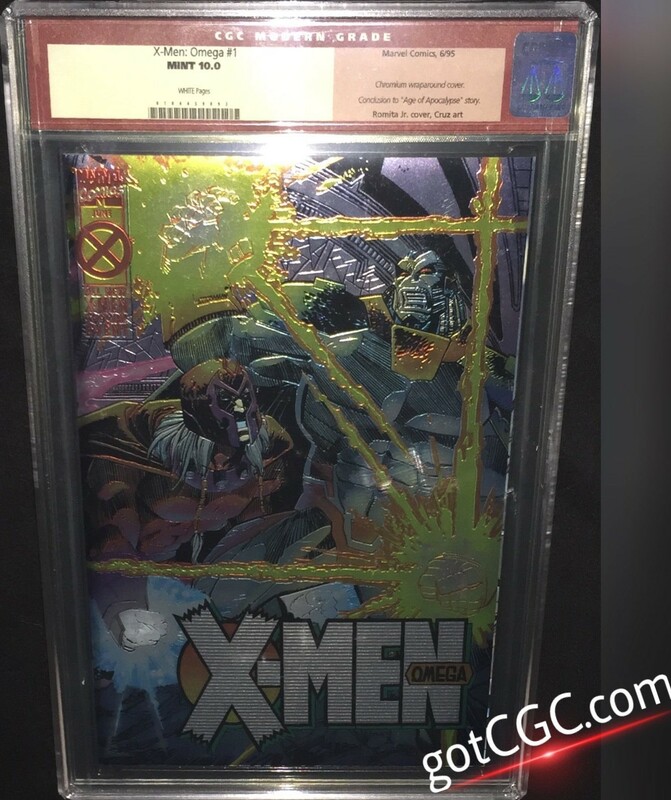 Sold on April 27, 2018 via eBay Buy It Now for $4,250. 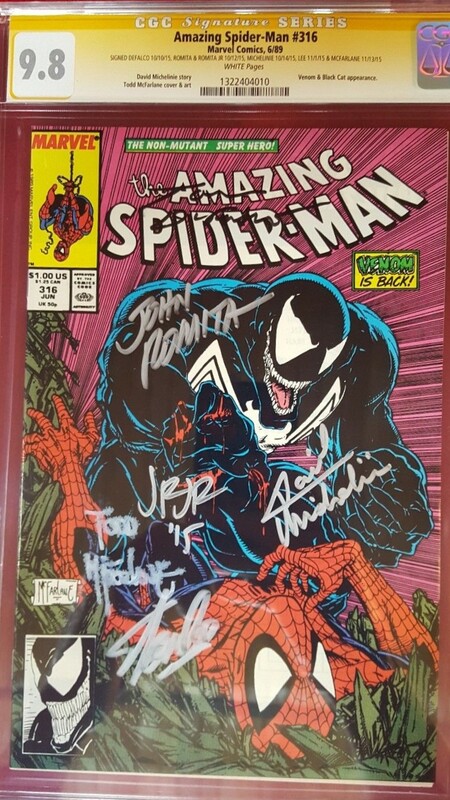 Signed by Stan Lee on the back cover on 07/22/2016. 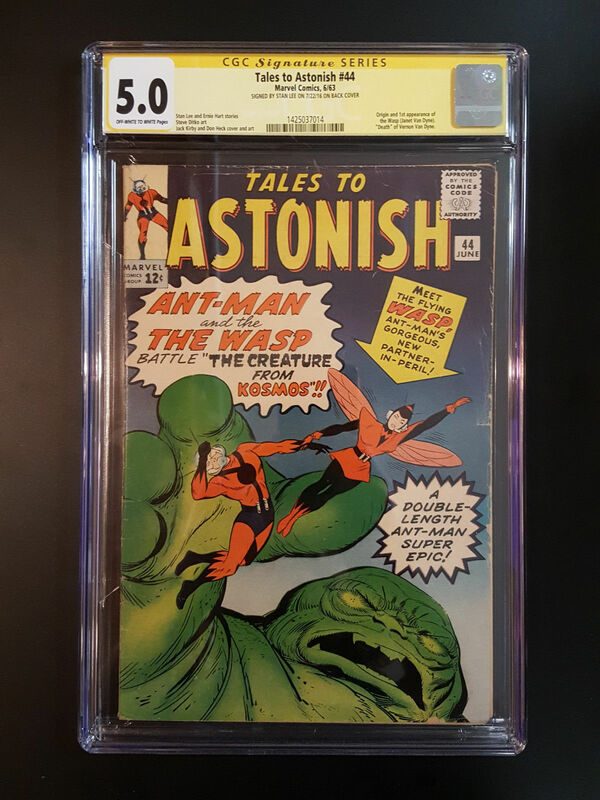 First Appearance and Origin of the Wasp. Sold on Saturday, June 23, 2018 via eBay Buy It Now for $1,500. 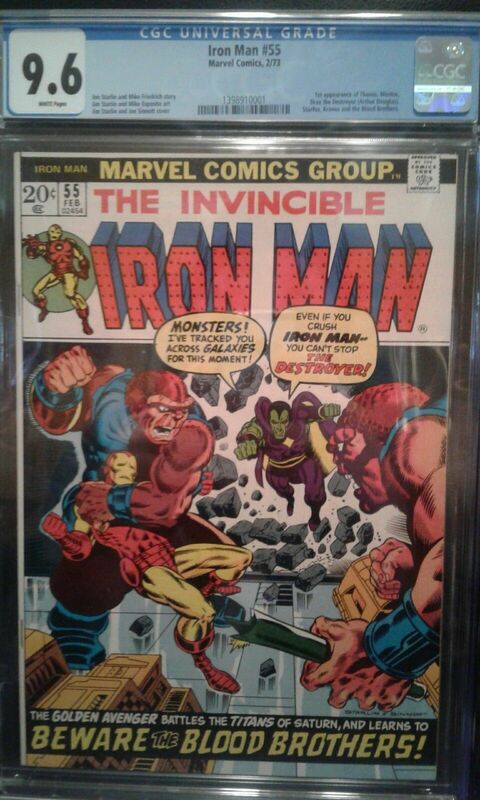 Signed by Bob Layton on 10/13/2013. Scott Lang becomes the new Ant-Man. 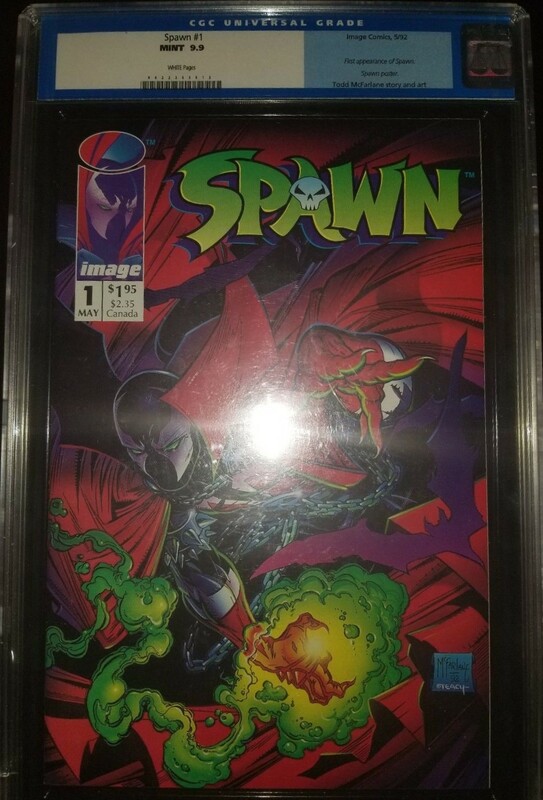 Sold on Monday, July 2, 2018 via eBay Auction for $724.99 with 41 bids. 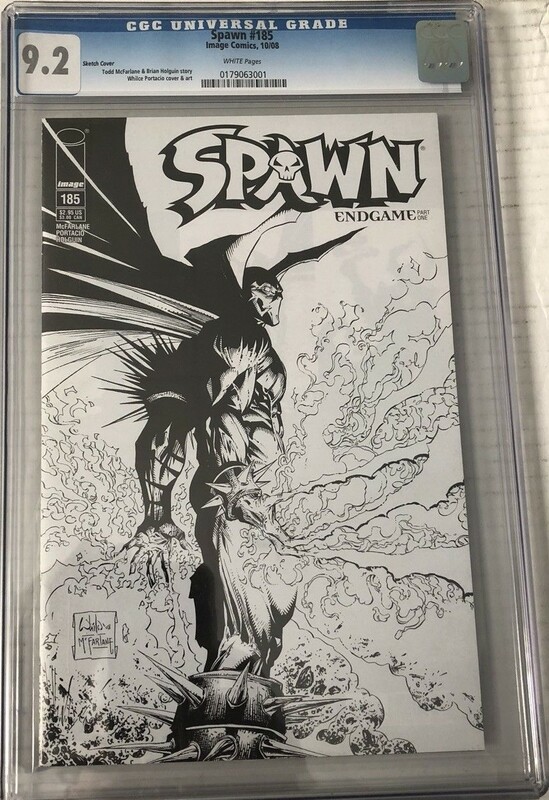 Signed & Sketch by Jim Lee on 12/19/2017. Sold on Friday, June 22, 2018 via eBay Best Offer for $5,350. Sold on Sunday, May 12, 2018 via eBay Best Offer for $3,395. 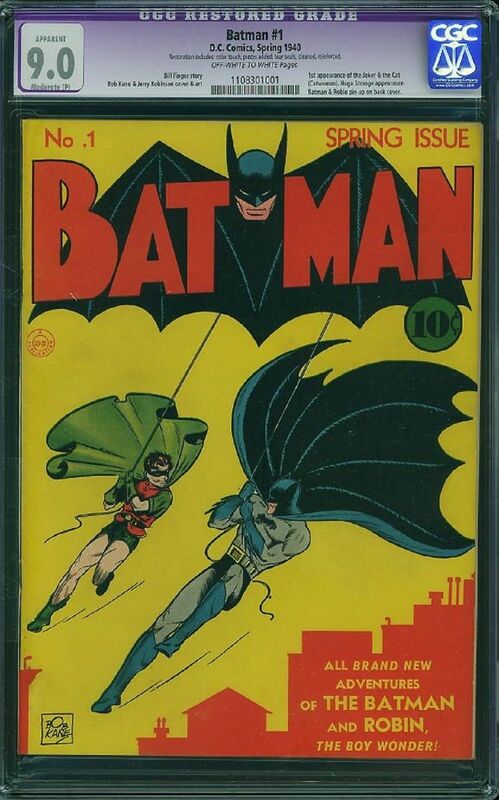 Sold on Sunday, June 24, 2018 via eBay Auction for $10,100 with 39 bids. First Appearance of J Jonah Jameson and the Chameleon. 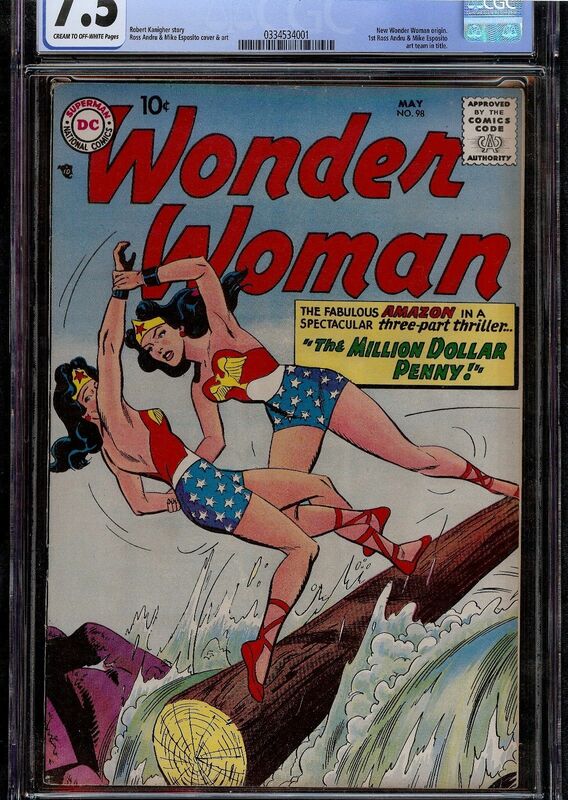 Sold on Friday, June 29, 2018 via eBay Auction for $12,221 with 49 bids. Sold on April 1, 2018 via eBay Best Offer for $9,800. 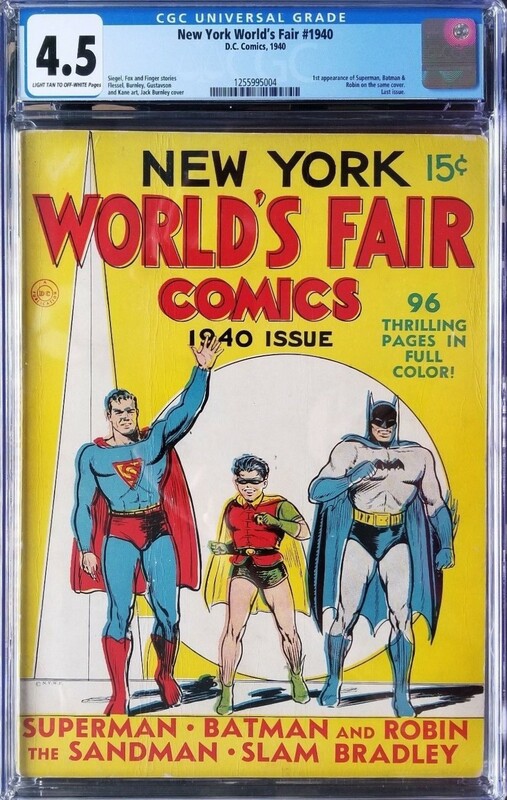 First Appearance of Superman, Batman & Robin on the same cover. 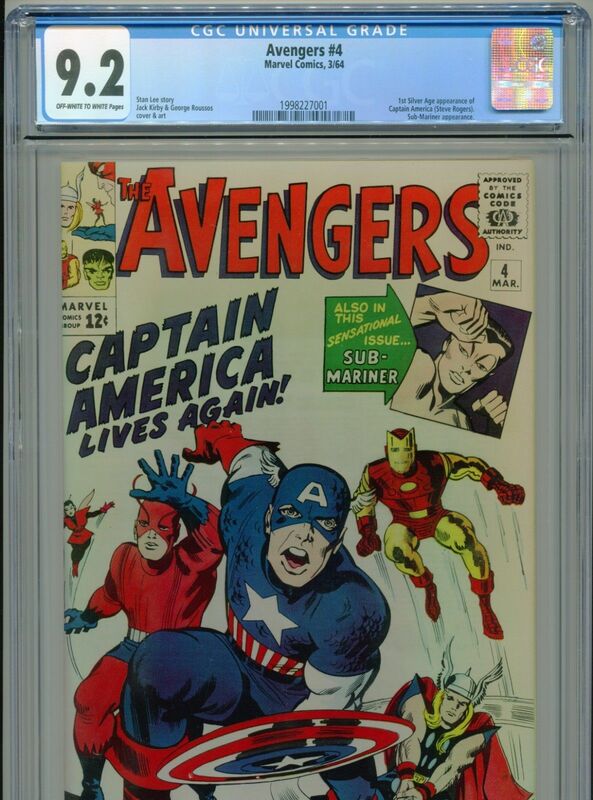 Sold on Sunday, June 17, 2018 via eBay Auction for $1,575 with 44 bids. 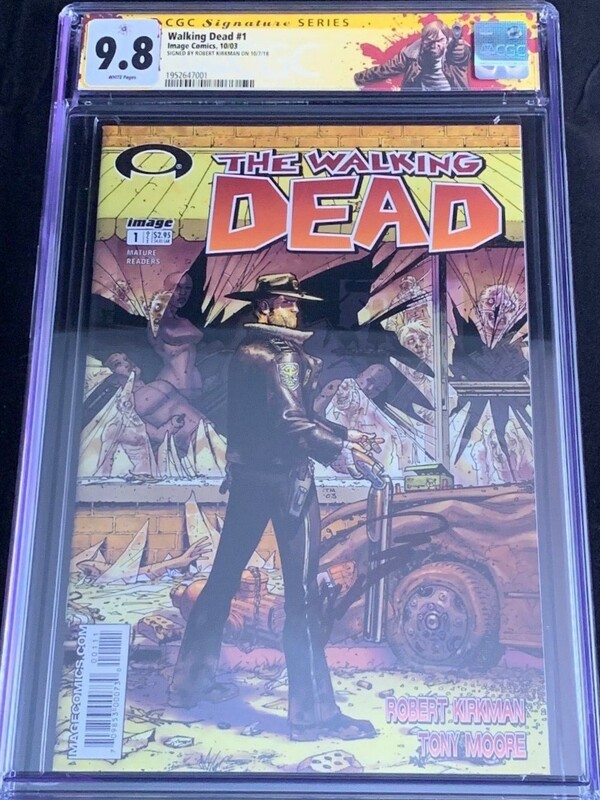 Sold on Sunday, June 3, 2018 via eBay Auction for $1,097 with 18 bids. Very minor amount of color touch on cover. Very minor amount of glue on cover. 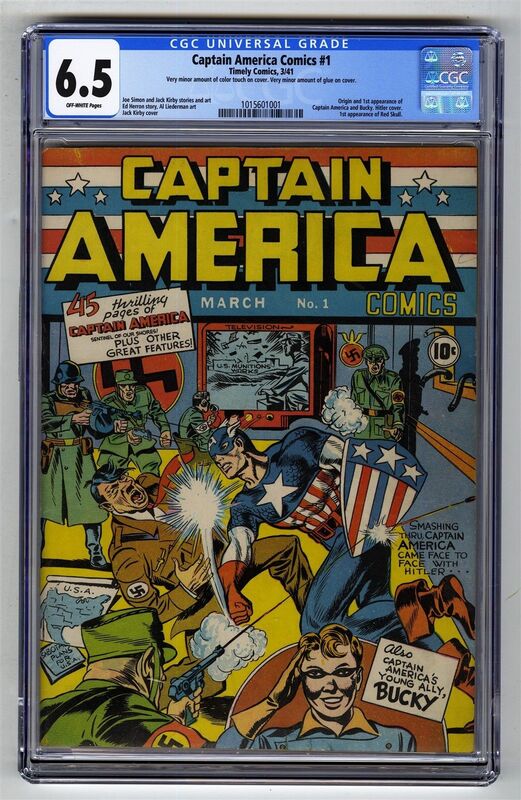 First Appearance of Captain America, Bucky and the Red Skull! 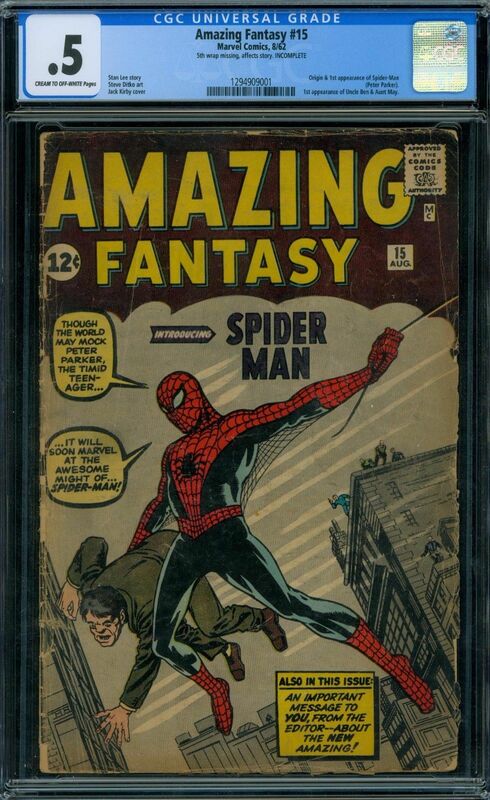 Sold on Saturday, June 24, 2018, 2018 via eBay Auction for $175,200 with 139 bids. Sold on Friday, June 22 via eBay Best Offer for $700. 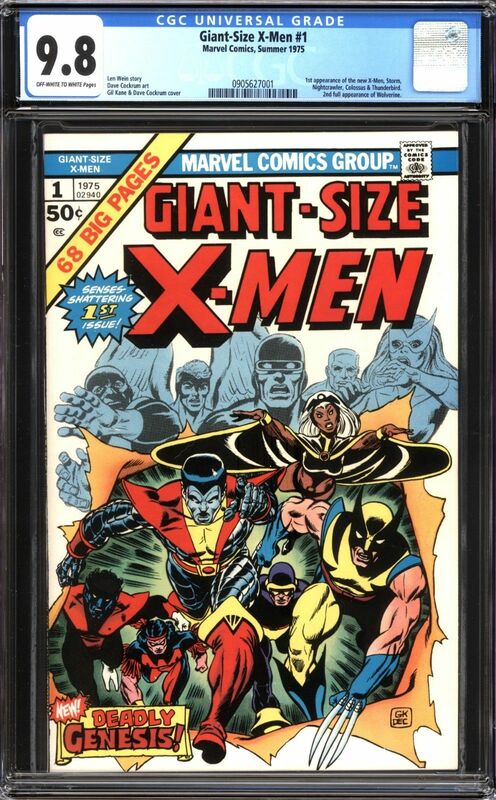 Sold on Thursday, June 21 for $591 via eBay Auction with 46 bids. 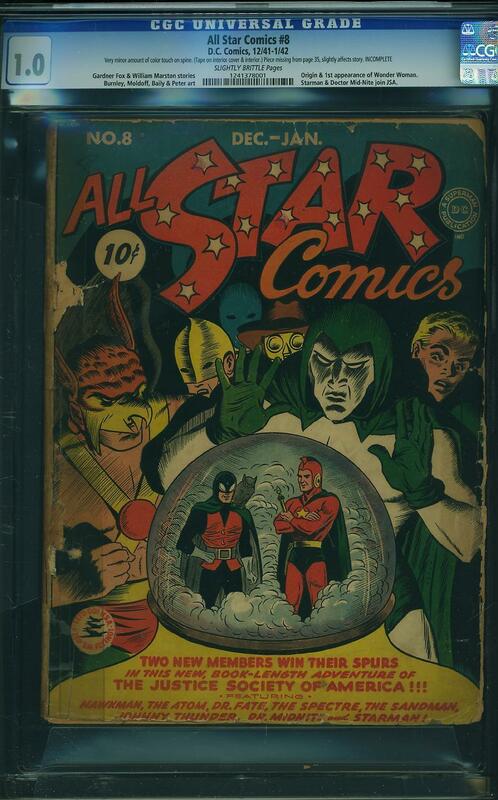 Sold on Sunday, June 3, 2018 for $10,900 via eBay Auction with 59 bids. 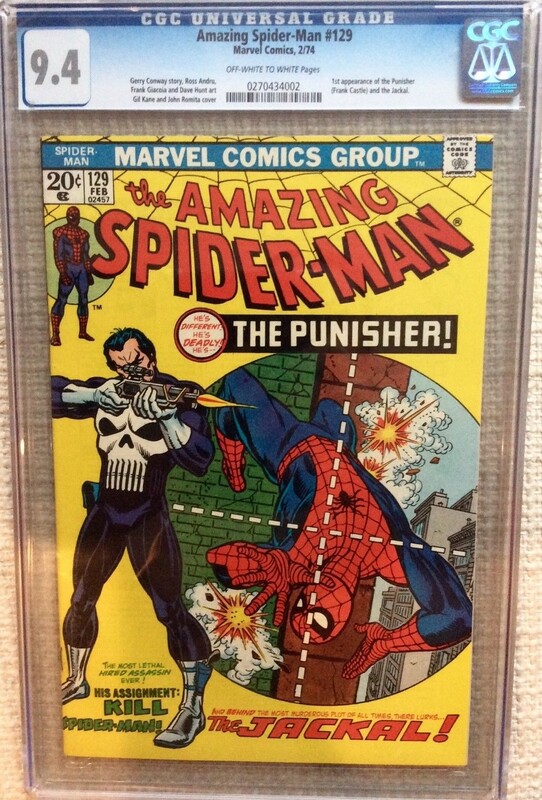 First Appearance of the Punisher. 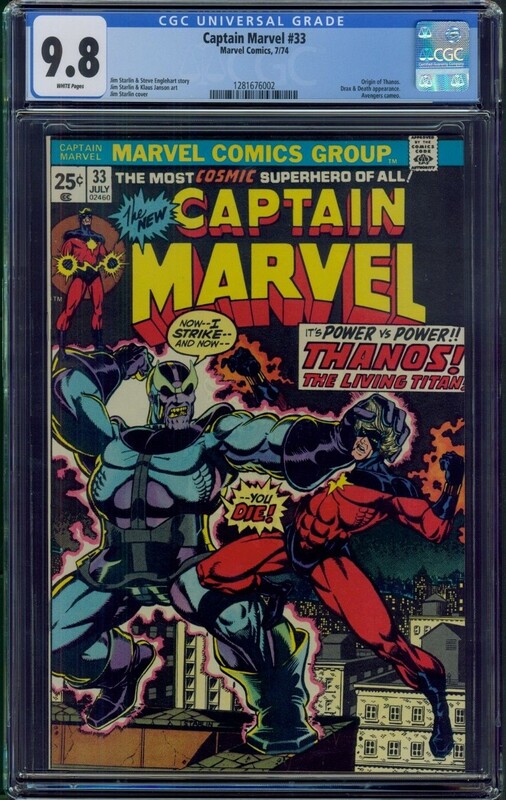 Sold on Sunday, June 10, 2018 for $2,828 via eBay Auction with 35 bids. 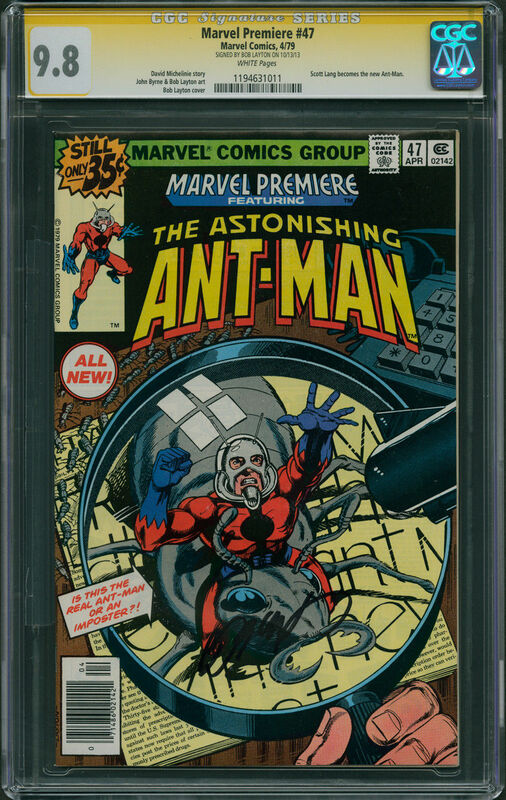 First Appearance of Henry Pym (Ant-Man). 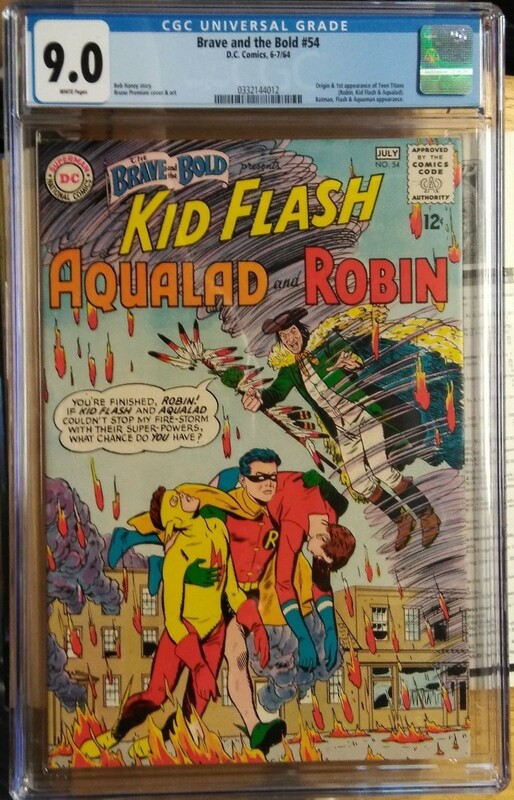 Sold on Wednesday, June 13, 2018 for $11,300 via eBay Auction with 31 bids. 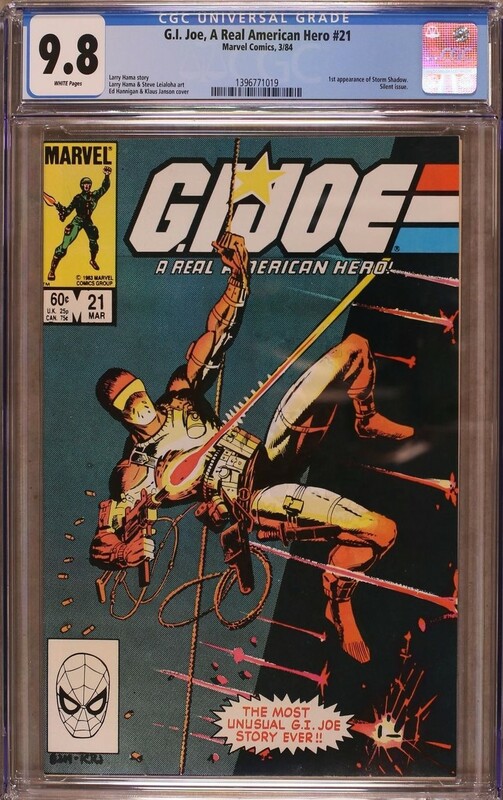 Sold on Friday, June 8, 2018 for $3,212 via eBay Auction with 44 bids. Sold on Friday, June 8, 2018 for $7,000 via eBay Best Offer. 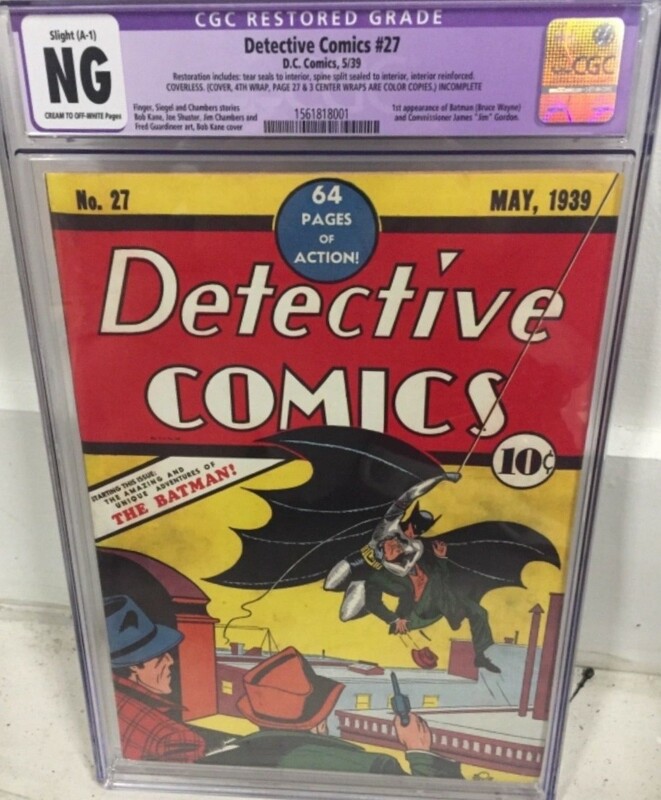 Sold on Wednesday, May 30 via eBay Auction for $2,800 with 34 bids. 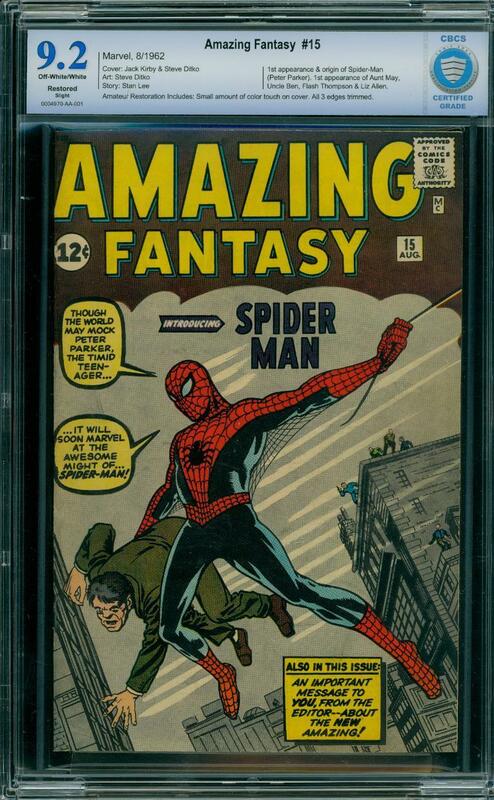 Sold on Thursday, May 31 via eBay Auction for $1,527.05 with 46 bids. 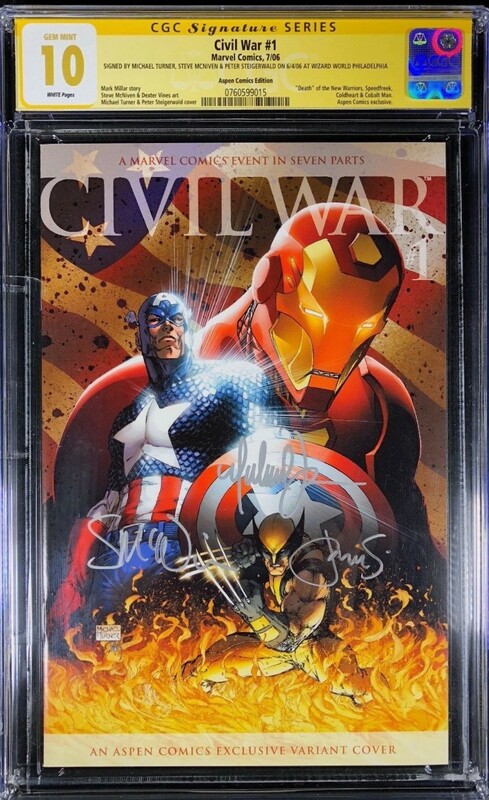 Signed by Michael Turner, Steve McNiven & Peter Steigerwald. Sold on Tuesday, May 8 via eBay Best Offer using two listings for a total of $2,700. Second listing is eBay Item #263670701431. 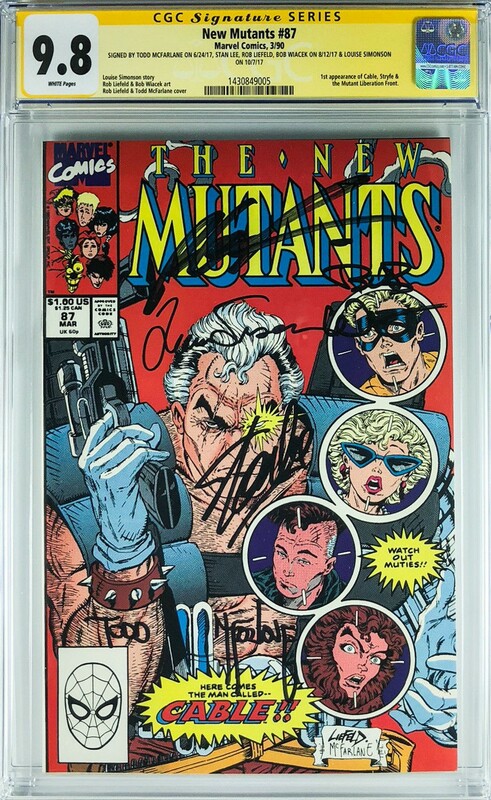 Signed by Todd McFarlane, Stan Lee, Bob Wiacek, Louise Simonson and Rob Liefeld. 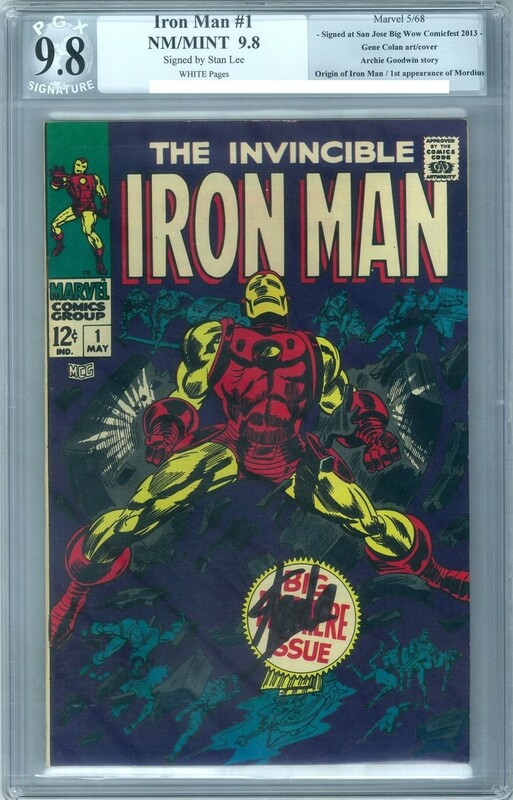 Sold on Saturday, April 14 via eBay Auction for $1,400 with 30 bids. Sold on Saturday, April 28 via eBay Auction for $2,550 with 47 bids. Conservation includes: tear seals to cover, spine split sealed to cover, cover reinforced. 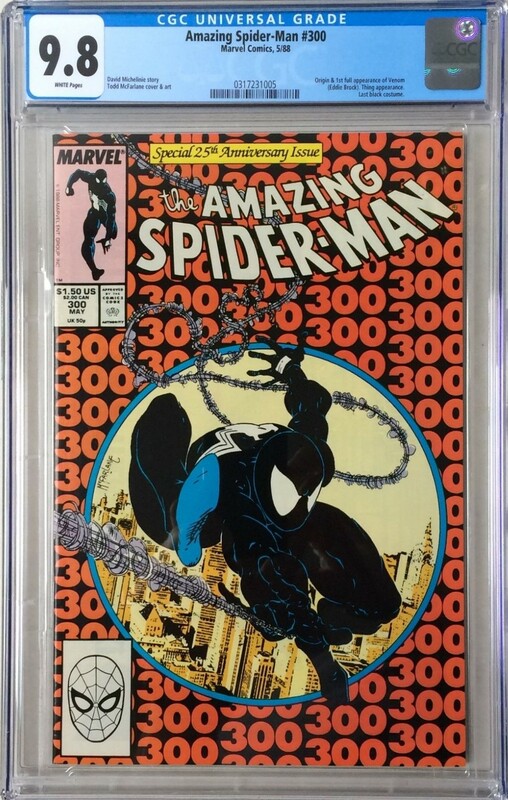 Sold on Monday, April 30 via eBay Auction for $5,348 with 21 bids. 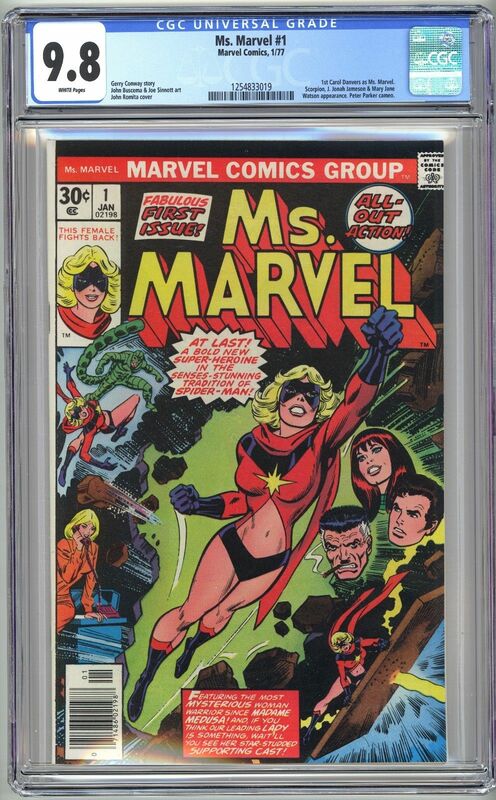 First Carol Danvers as Ms. Marvel. 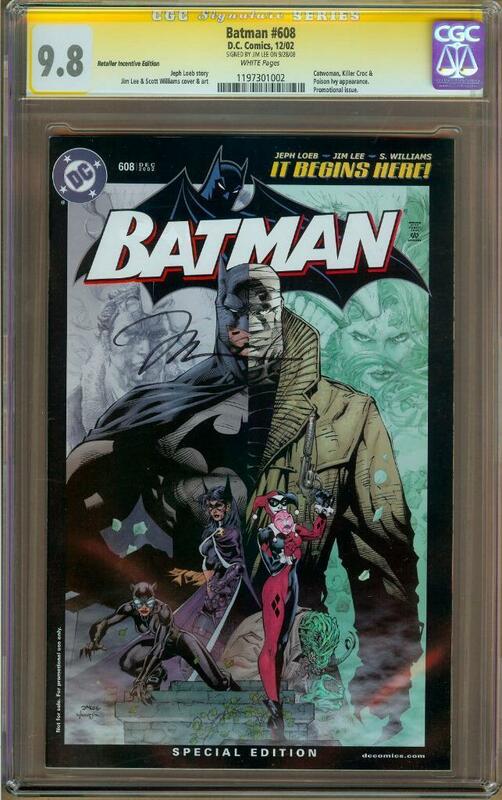 Sold on Monday, May 14 for $1899.95 via eBay Buy It Now. 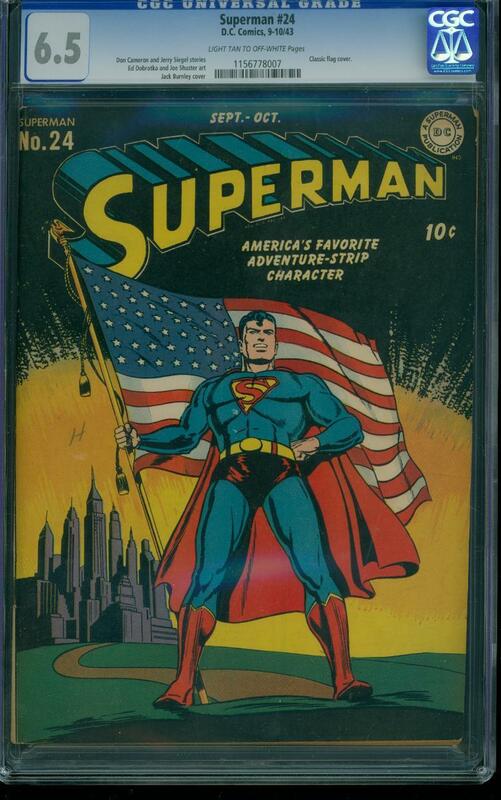 Sold on Sunday, May 13 for $6,149 via eBay Auction with 54 bids. Amateur Restoration: Small amount of color touch on cover. All 3 edges trimmed. Sold on Thursday, February 8 for $35,500 via Best Offer. Originally listed with a Buy It Now price of $39,995. 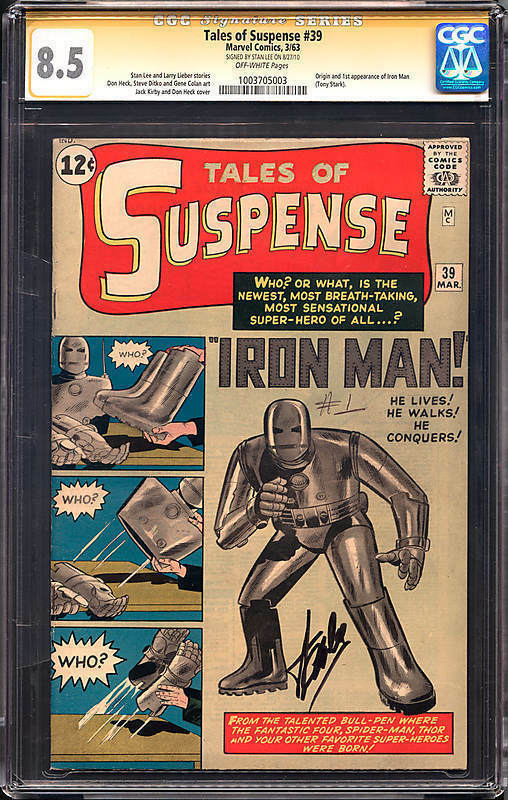 Sold on Monday, March 26 for $65,800 via eBay Auction with 175 bids. 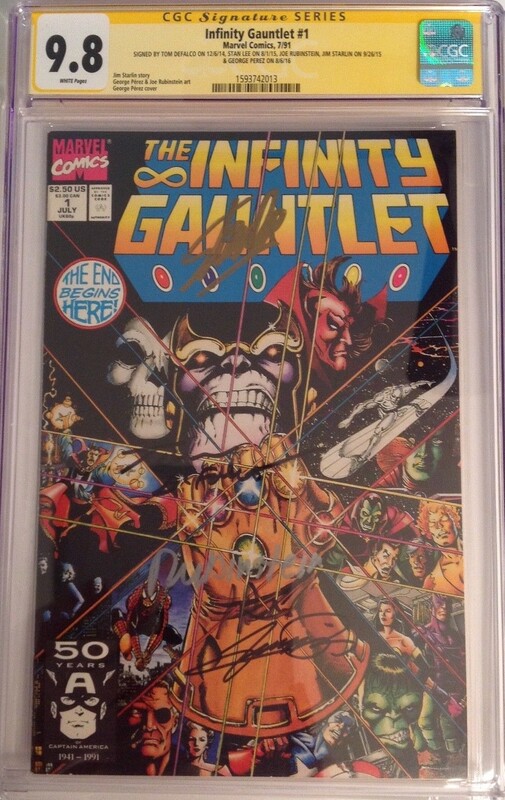 Signed by Stan Lee, Jim Starlin, Joe Rubinstein, Tom DeFalco and George Perez! 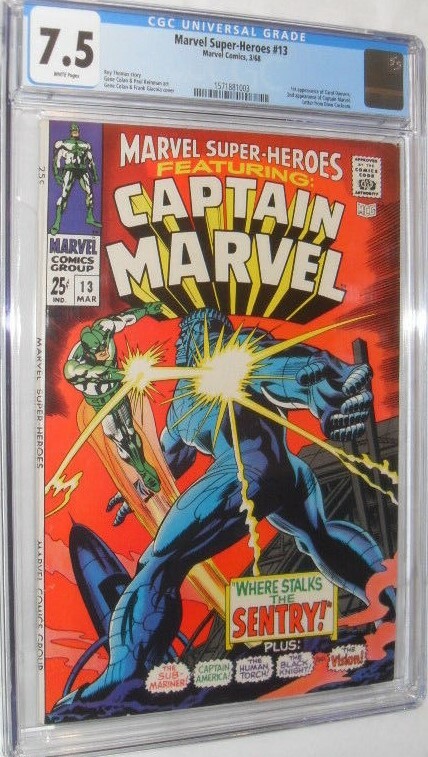 Sold on Monay, May 7 for $1,650 via Best Offer. Originally listed for sale at $2,000. 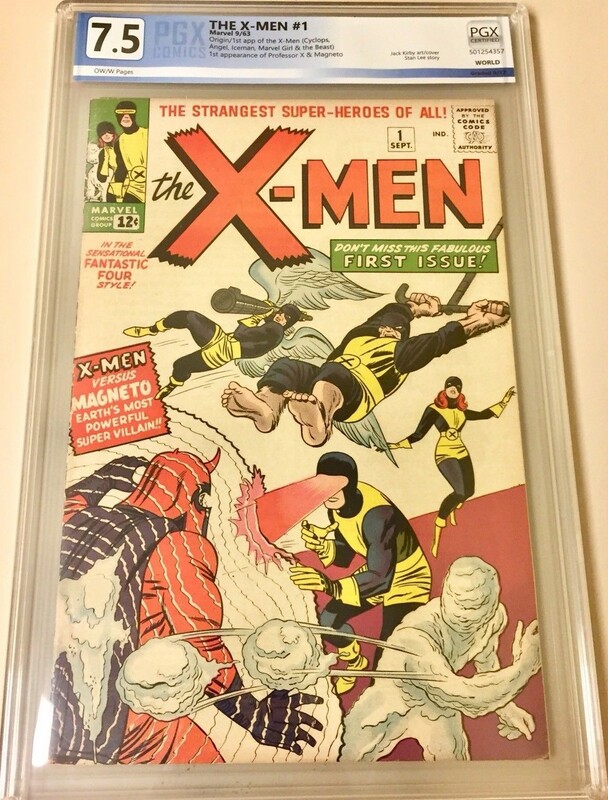 First Appearance of the X-Men and Magneto! 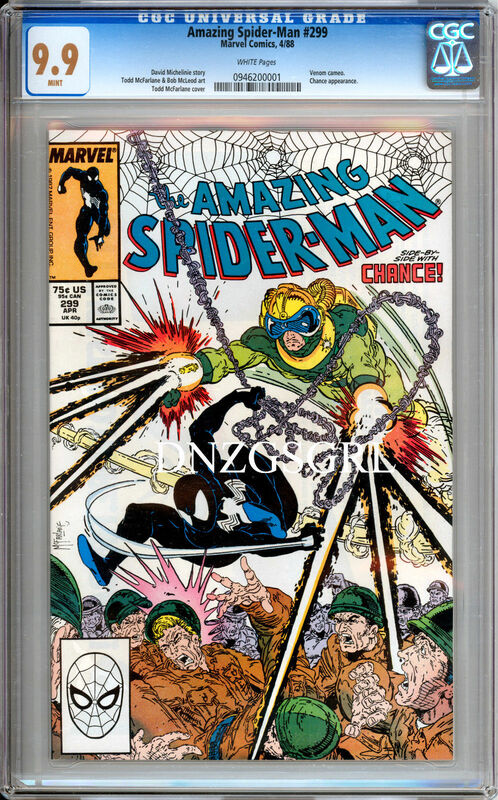 Sold on Monay, May 7 for $12,900 via eBay Auction with 99 bids. Convention Edition with Silver Foil Cover. 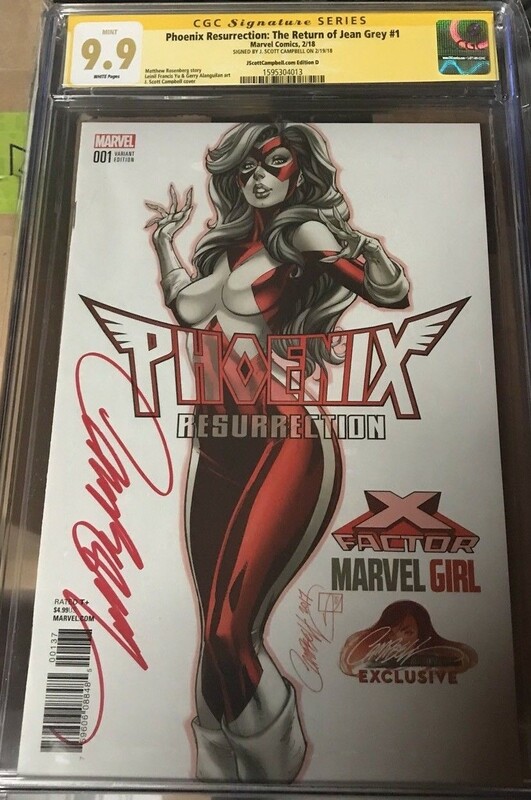 Signed by Jim Lee, Scott Williams, and Alex Sinclair. 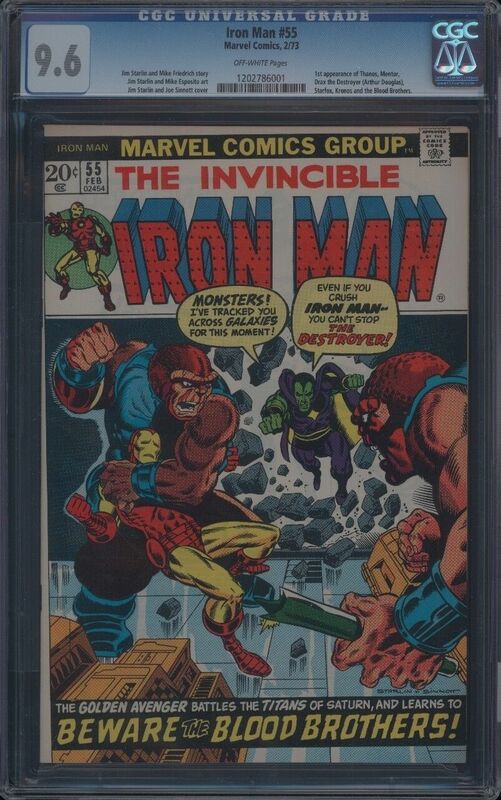 Sold on Thursday, May 3 for $150 via eBay Best Offer. Part 1 of "Star Wars: A New Hope" movie adaptation. 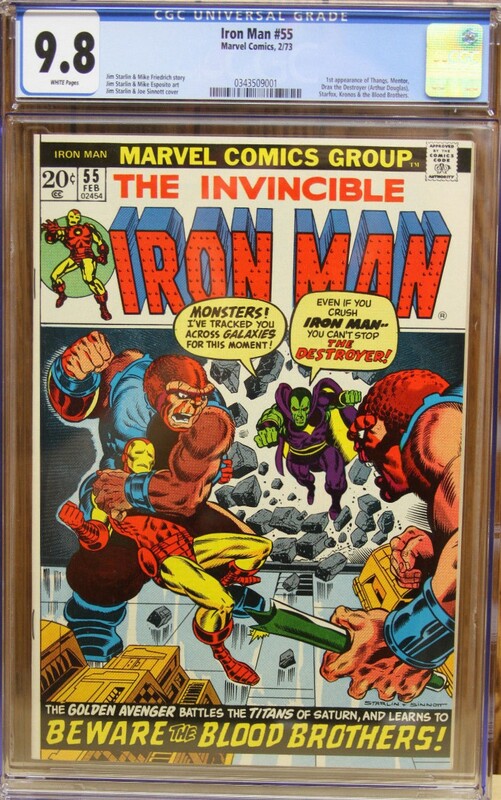 Sold on Friday, May 4 for $7,000 via eBay Best Offer. 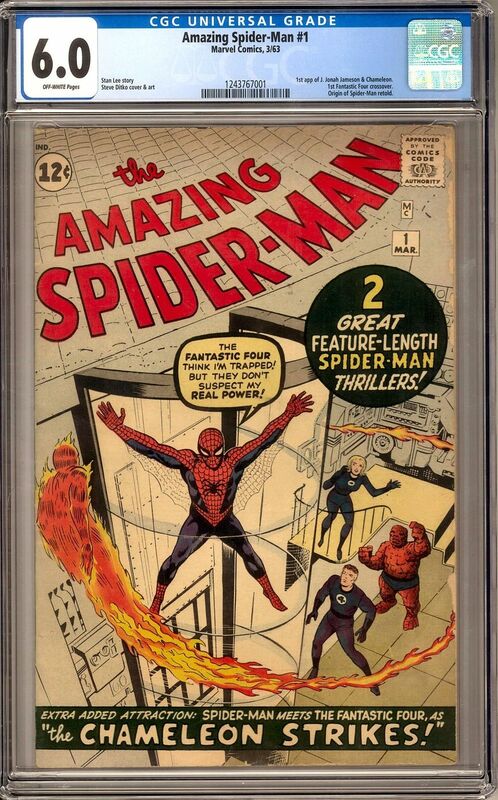 Sold on Tuesday, April 3 for $7,601.99 via eBay Auction with 48 bids. 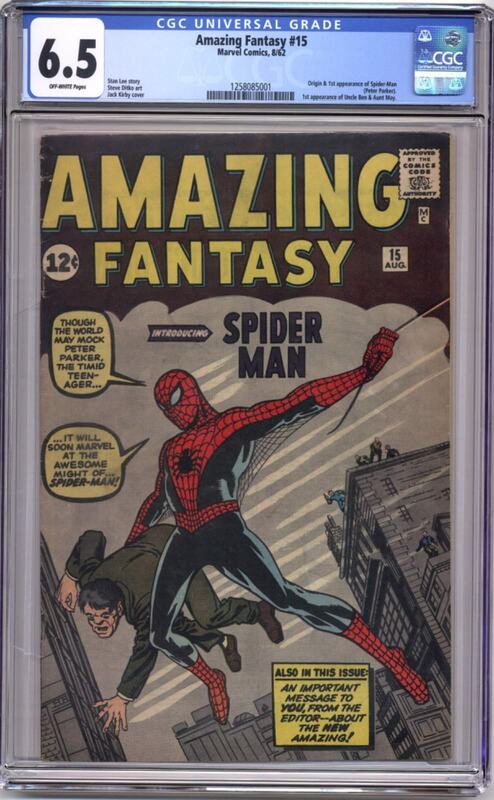 Sold on Saturday, April 28 for $8,132.70 via eBay Auction with 20 bids. 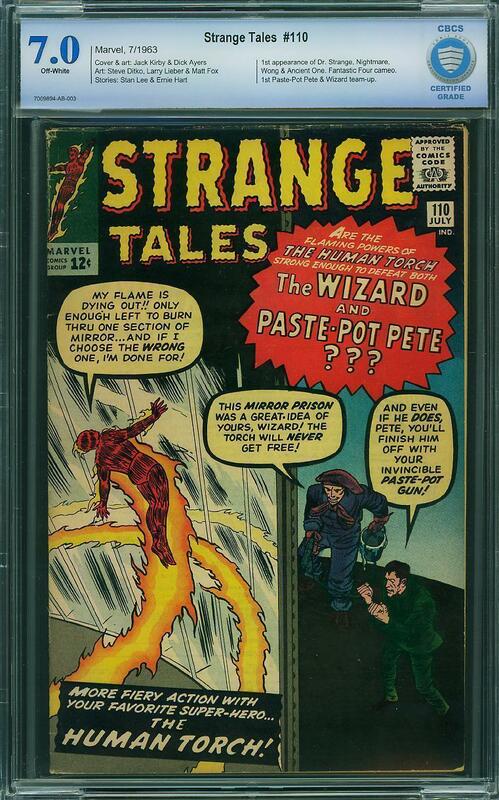 Sold on Wednesday, April 25, 2018 for $3,725 via eBay auction with 28 bids. Sold on Sunday, March 18 for $5,800 via auction with 30 bids. Sold on Wednesday, March 21, 2018 for $1,775 via auction with 32 bids. Sold on Tuesday, January 16, 2018 for $3,750 via eBay Best Offer. 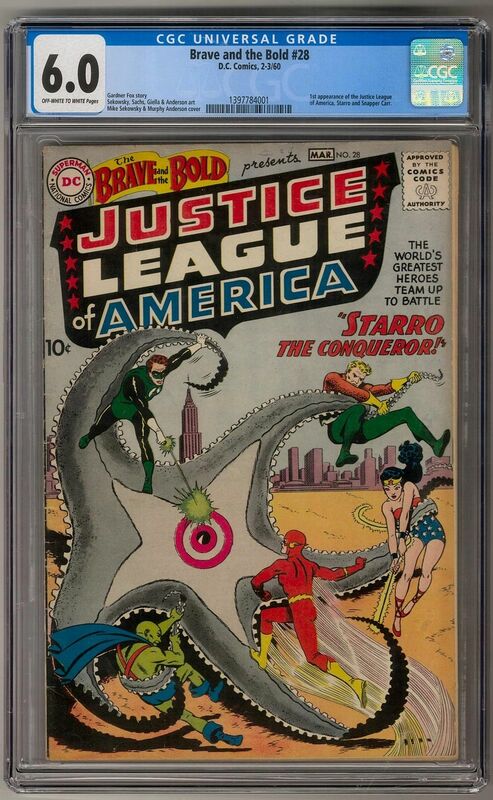 Origin and First Appearance of Silver Age Wonder Woman. Sold on Saturday, March 17, 2018 for $7,000 via eBay Best Offer. 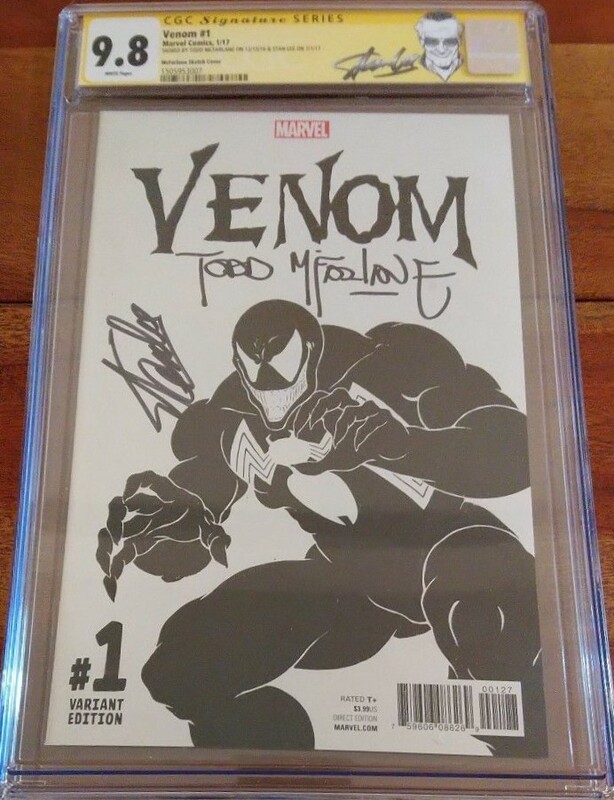 Origin and First Appearance of Venom. 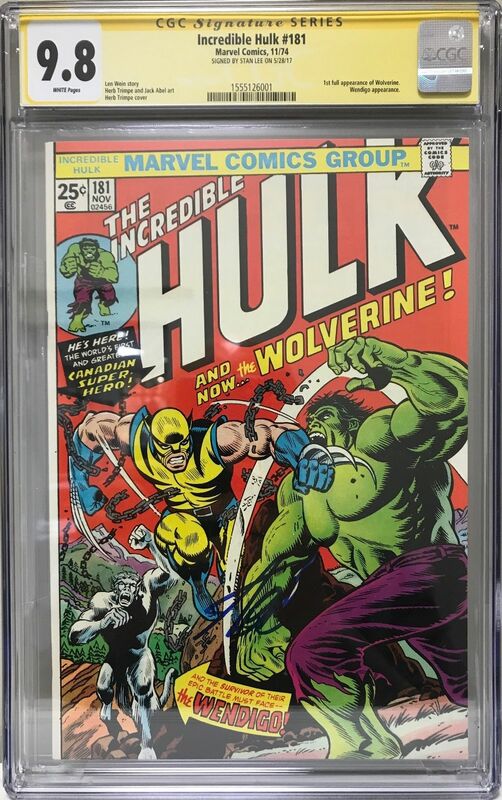 Sold on Sunday, March 11, 2018 for $2,200 via eBay Buy It Now. 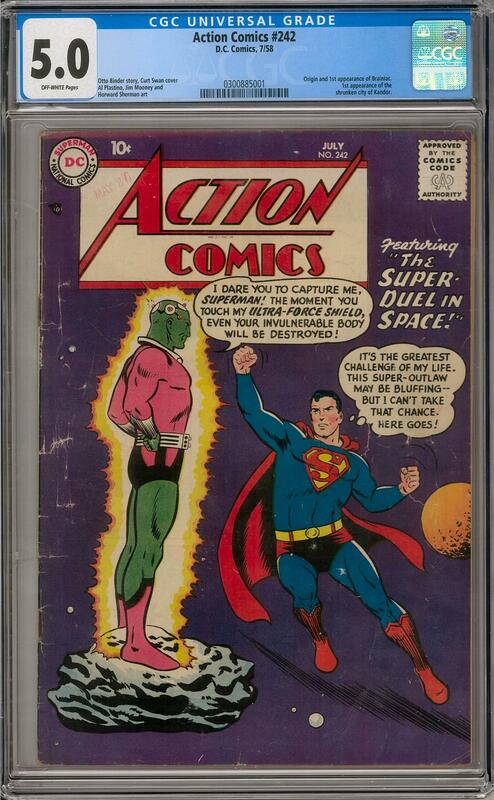 Origin and First Appearance of Brainiac. First appearance of Kandor. 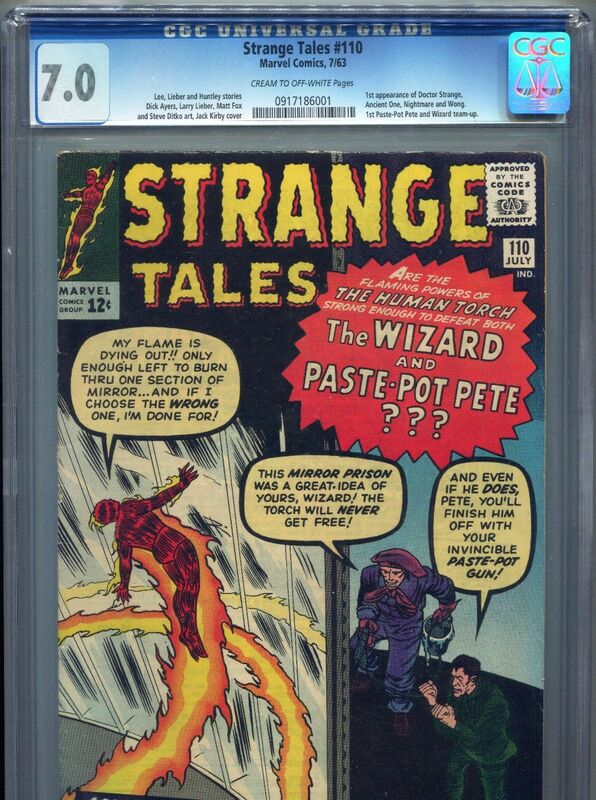 Sold on Sunday, March 4, 2018 for $2,700 via eBay Auction with 27 bids. 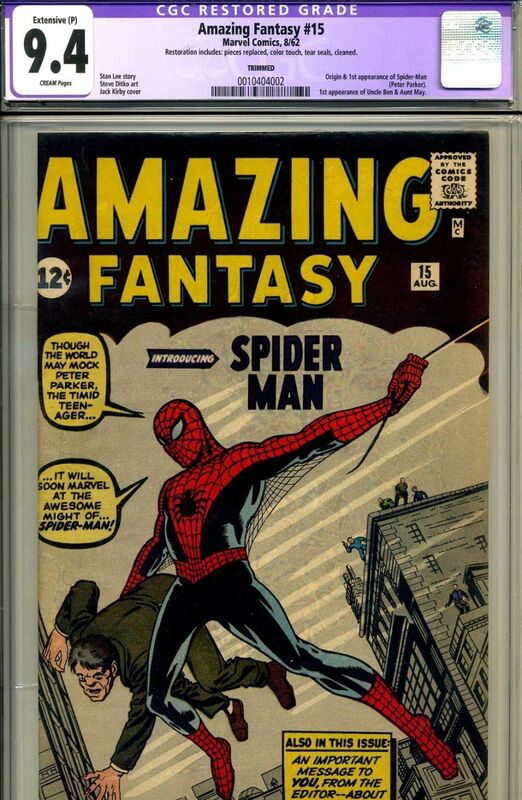 Sold on Monday, January 22, 2018 for $2,612 via eBay Auction with 28 bids. 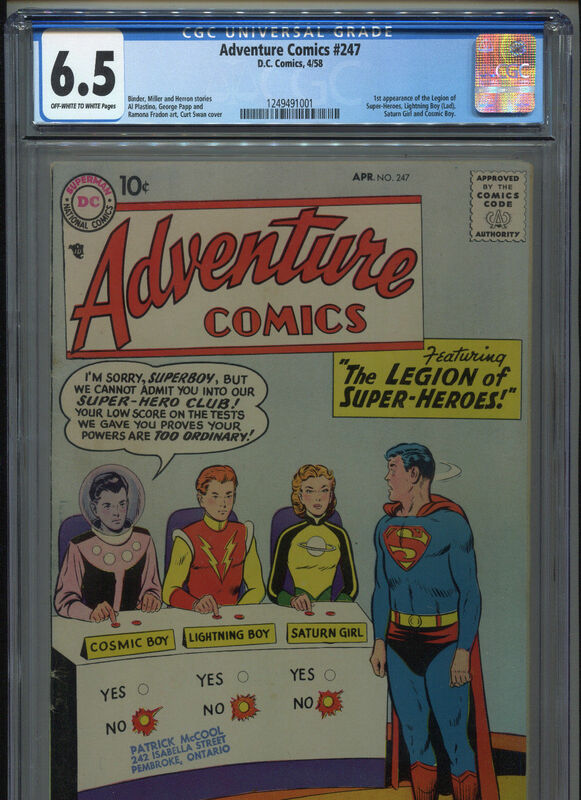 Sold on Friday, February 11, 2018 for $4,100 via eBay Buy It Now. Sold on Saturday, February 24, 2018 for $8,000 via eBay Buy It Now. Sold on Saturday, January 28, 2018 for $25,000 via eBay Best Offer. 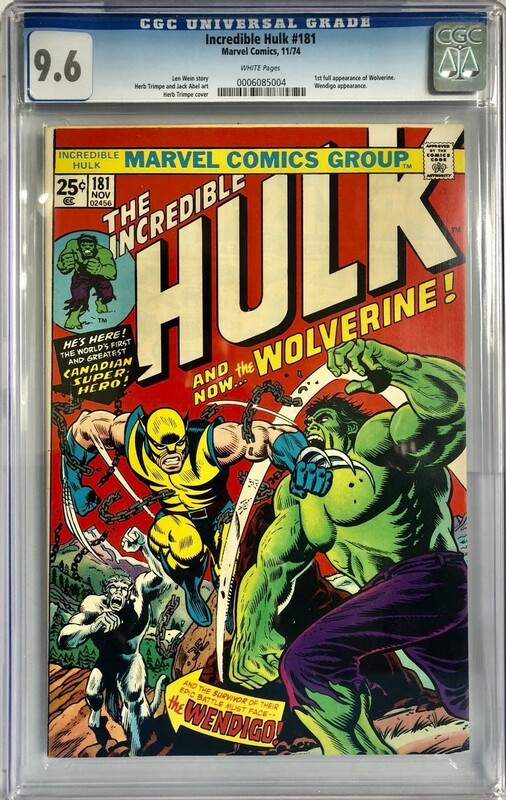 Sold on Monday, February 26 for $27,500 via eBay Best Offer. 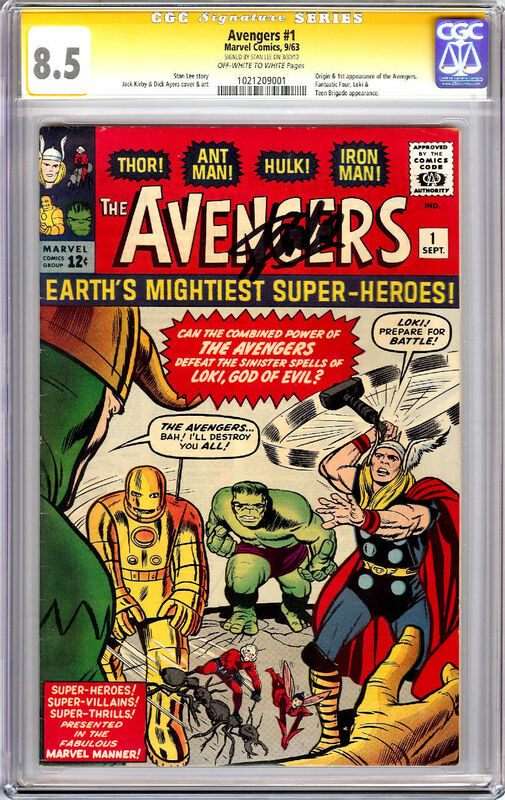 Sold on Monday, March 12, 2018 for $1,749.99 via eBay Best Offer. 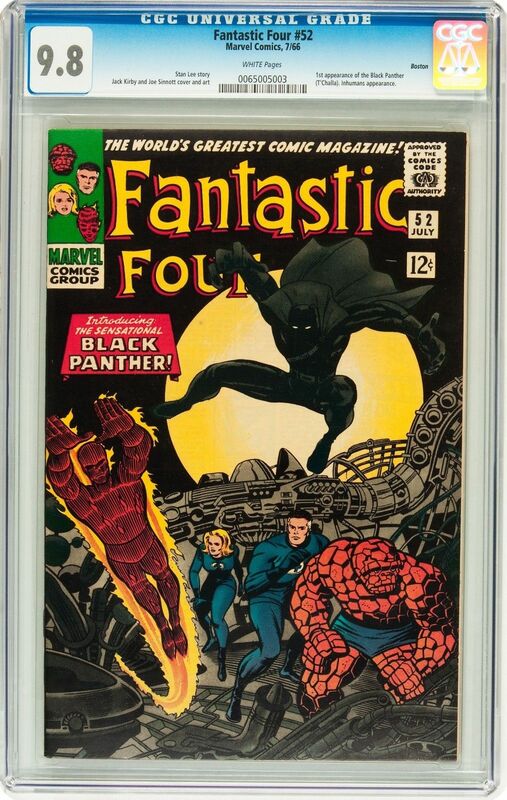 First Appearance of the Black Panther. 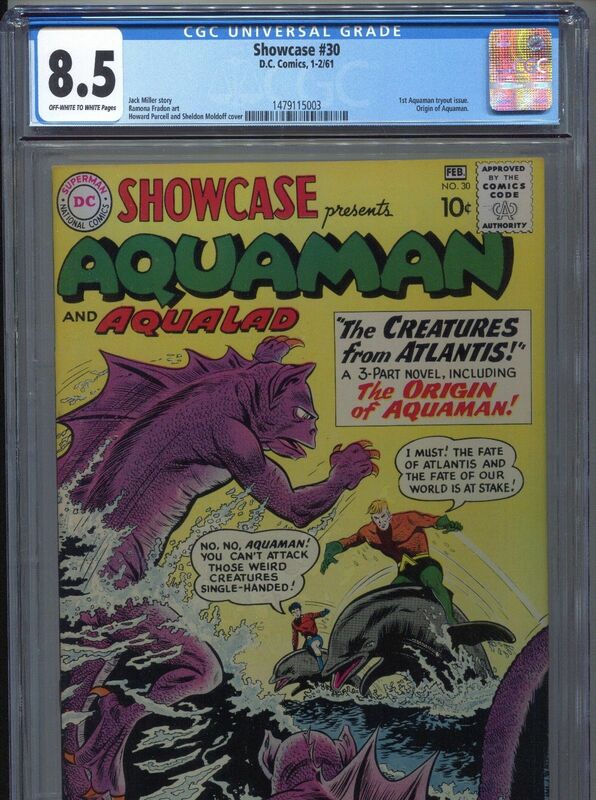 Highest CGC Grade for this issue! 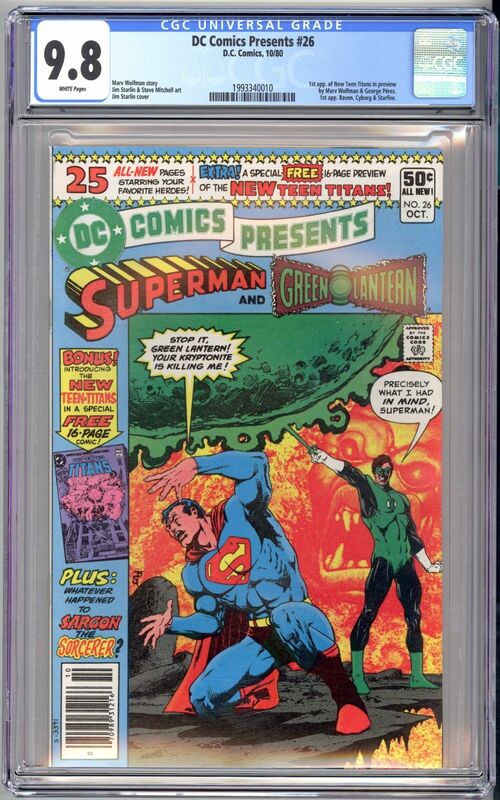 Sold on December 27, 2017 for $51,700 via eBay Auction with 54 bids. Sold on Wednesday, March 7, 2017 for $75,535 via eBay Buy It Now. when our reports are updated!